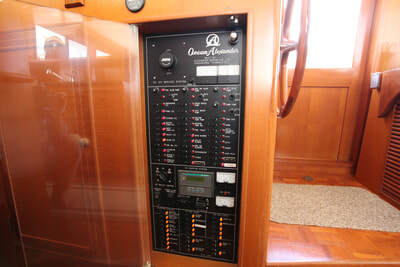 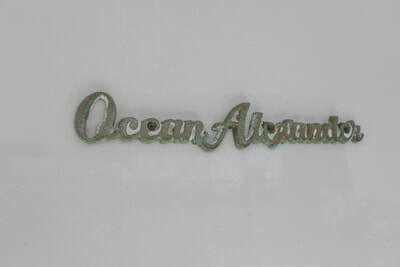 This Ocean Alexander is a 2 stateroom sedan style motoryacht. 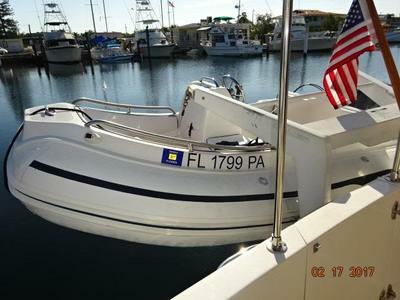 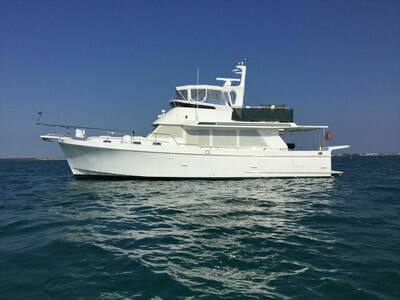 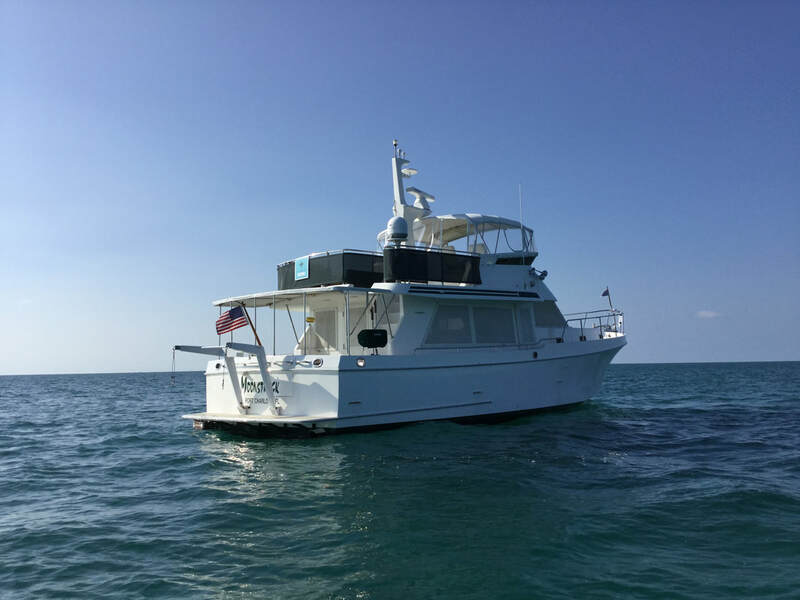 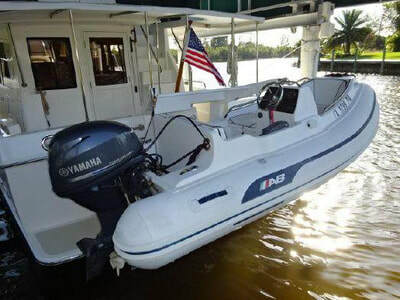 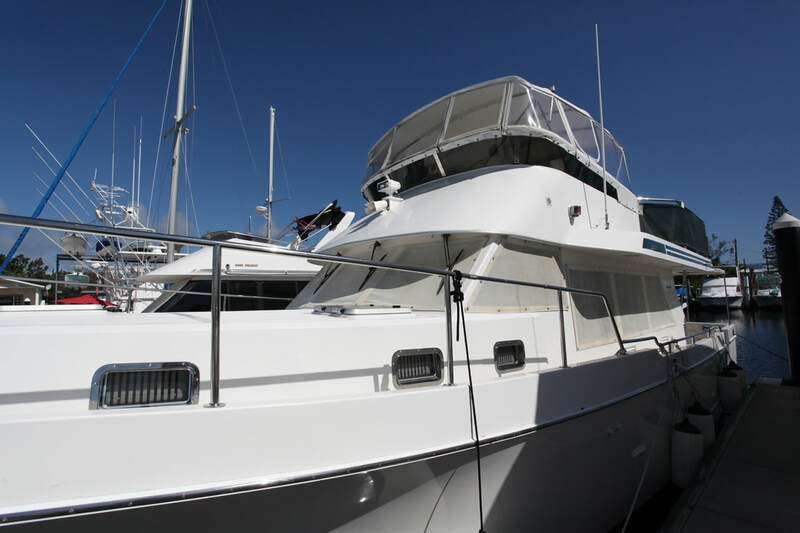 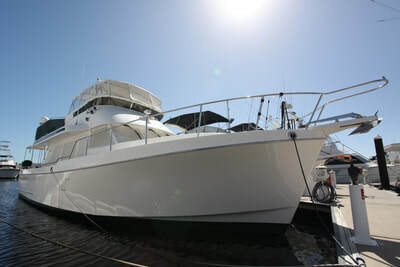 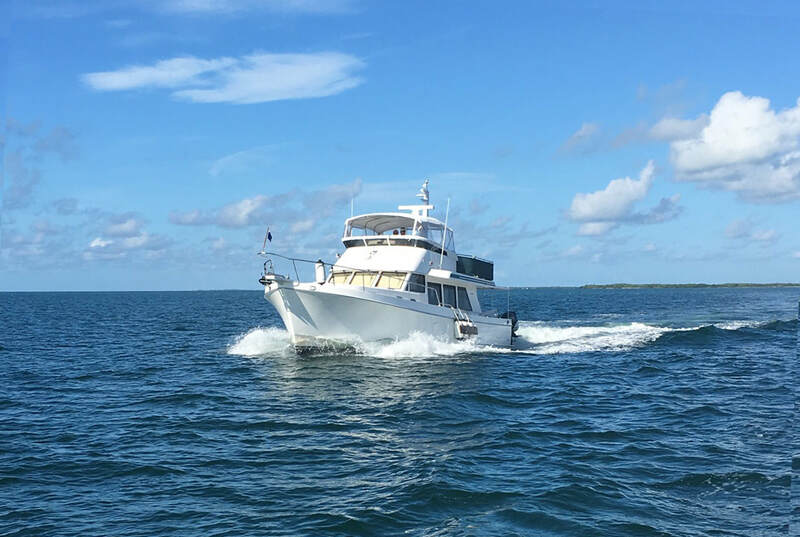 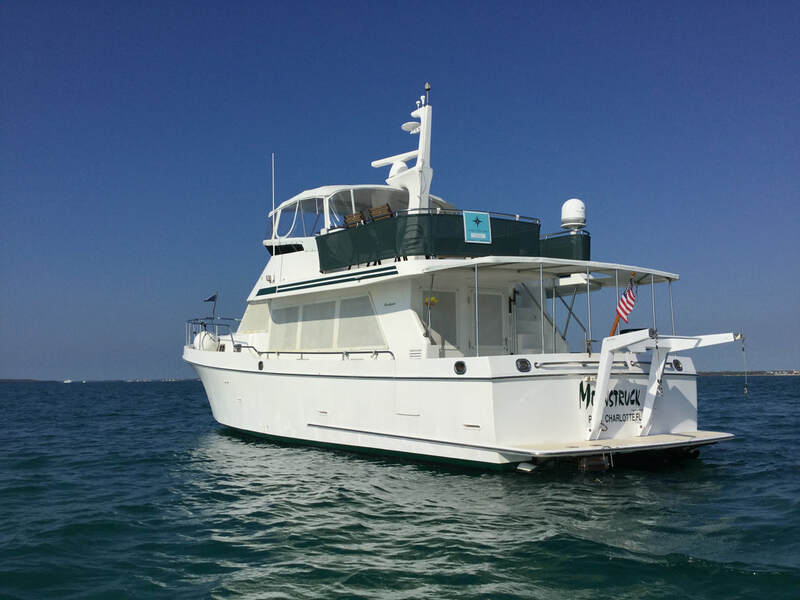 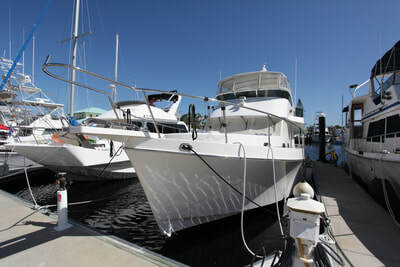 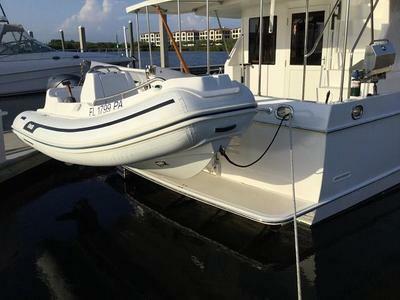 Great for cruising the islands, experiencing the Great Loop or that exceptional liveaboard. 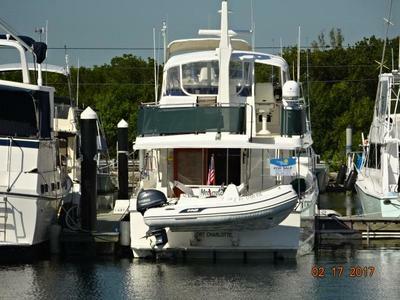 Moonstruck is a 2 stateroom Ocean Alexander sedan style motoryacht . She offers a bowthruster, CAT main engines and a covered aftdeck and large flybridge design for great exterior entertainment and relaxation areas. Her interior is beautiful teak interior. 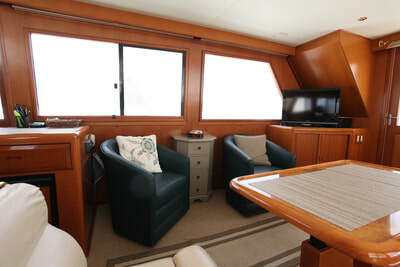 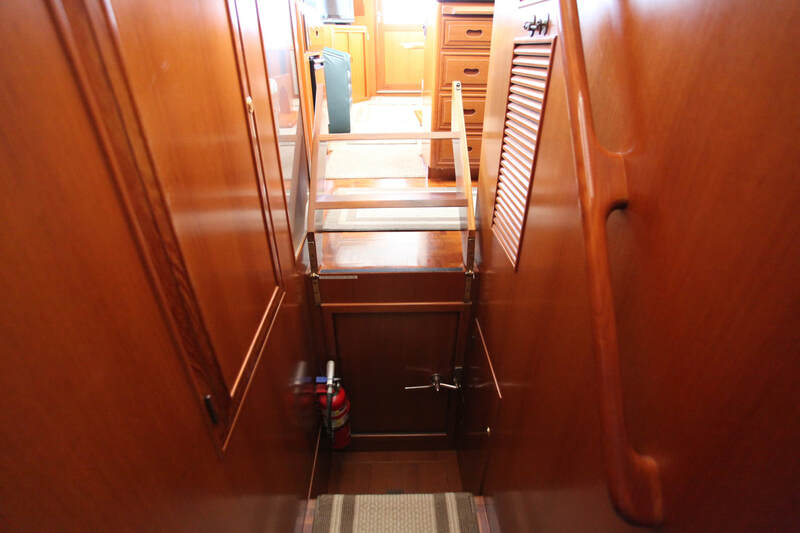 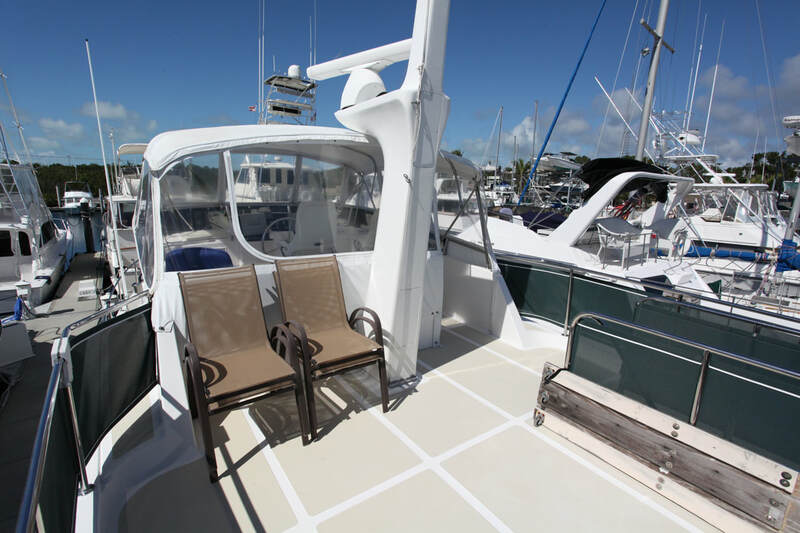 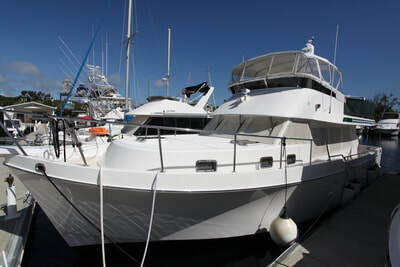 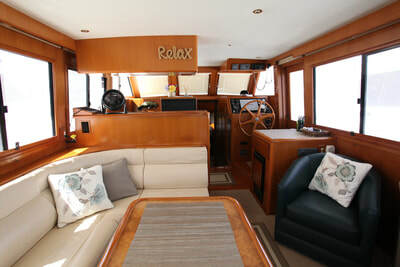 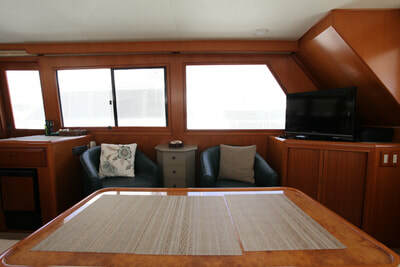 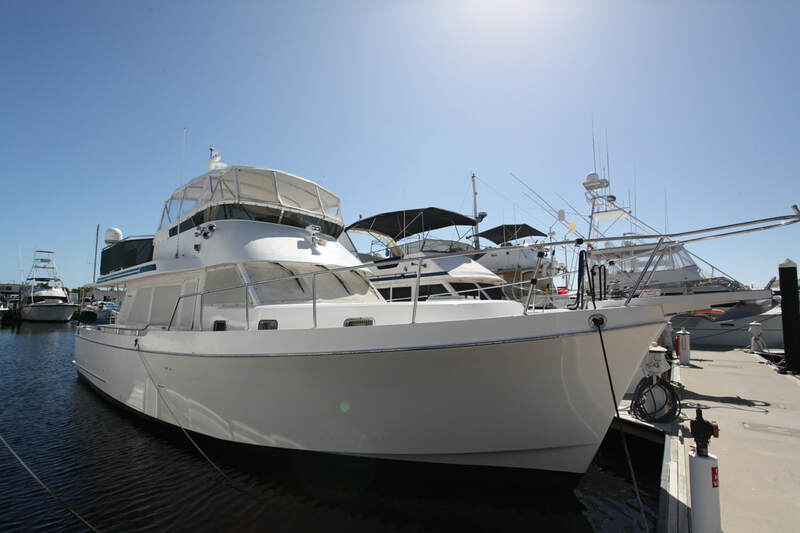 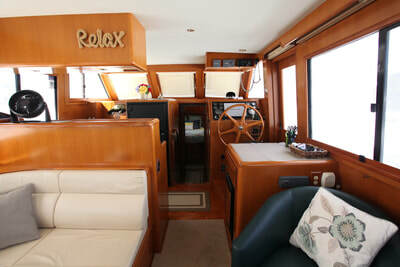 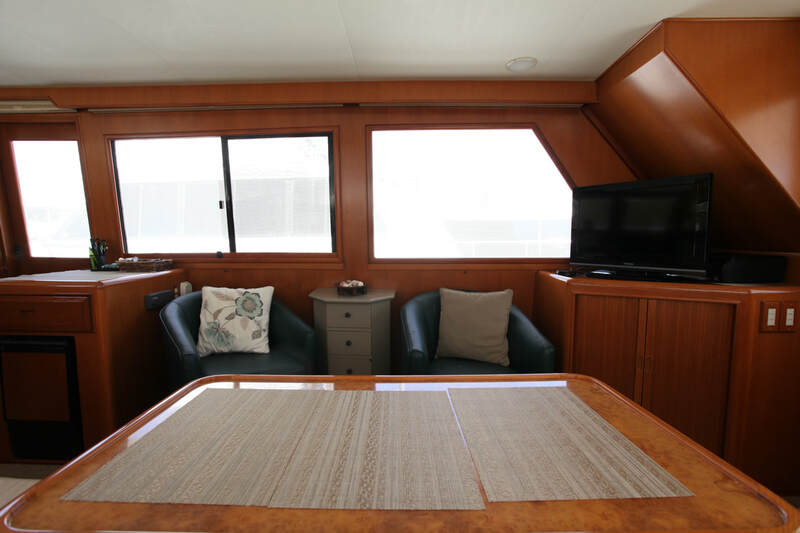 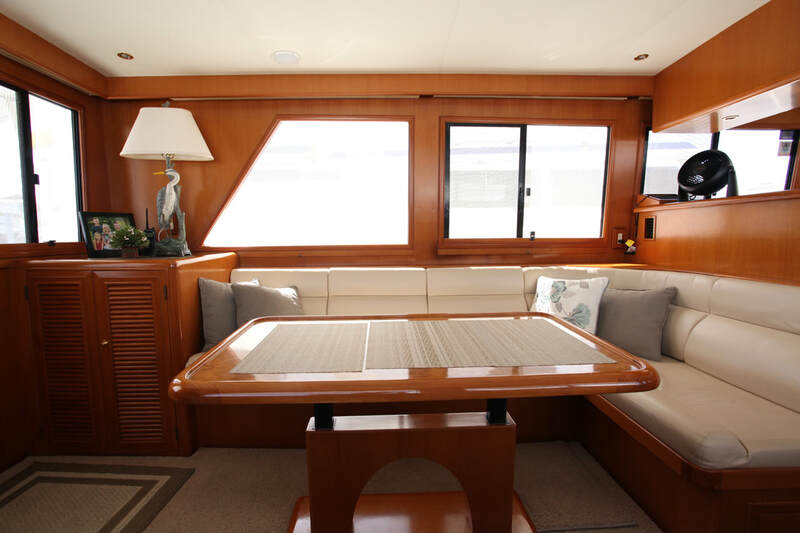 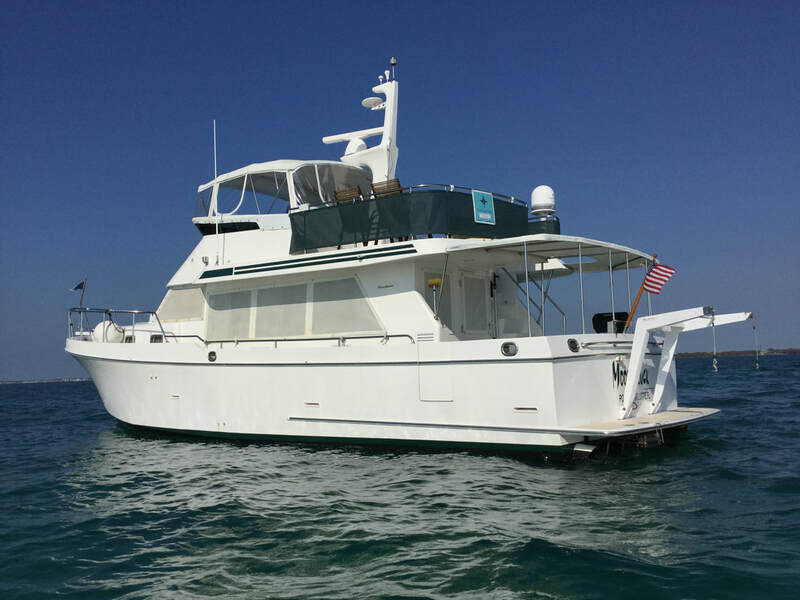 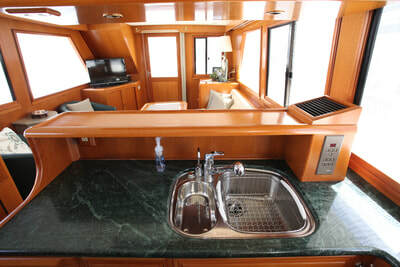 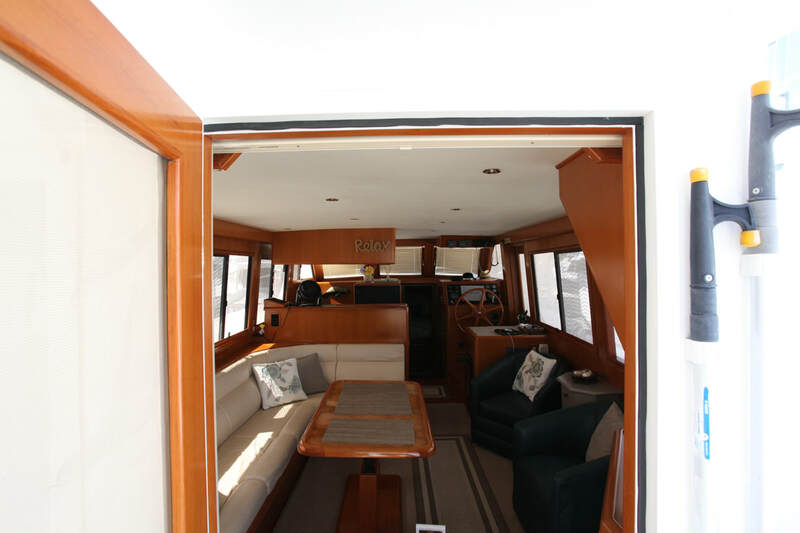 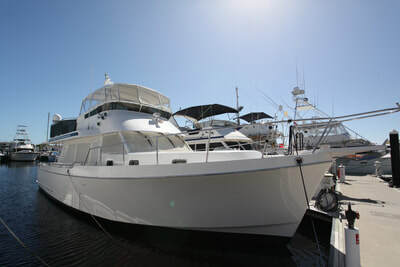 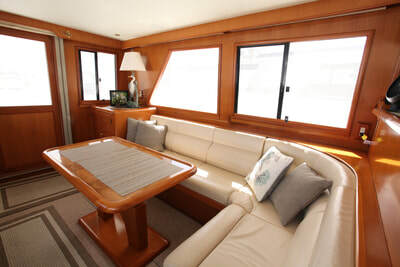 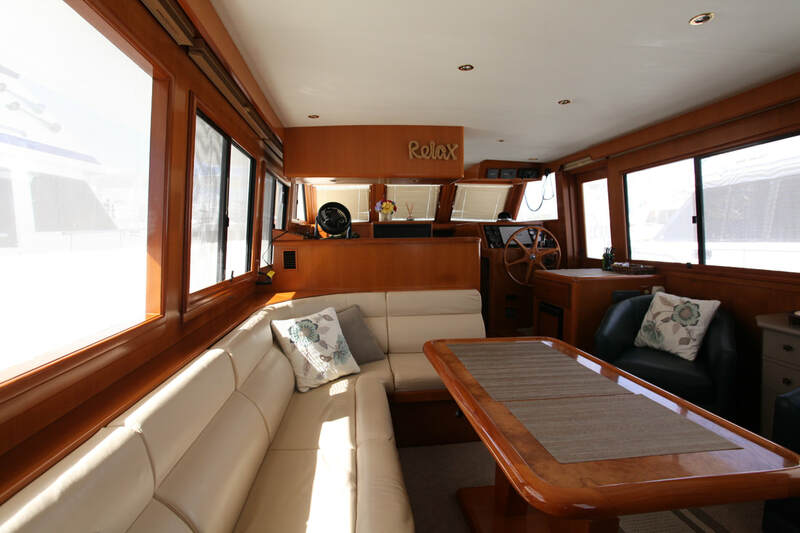 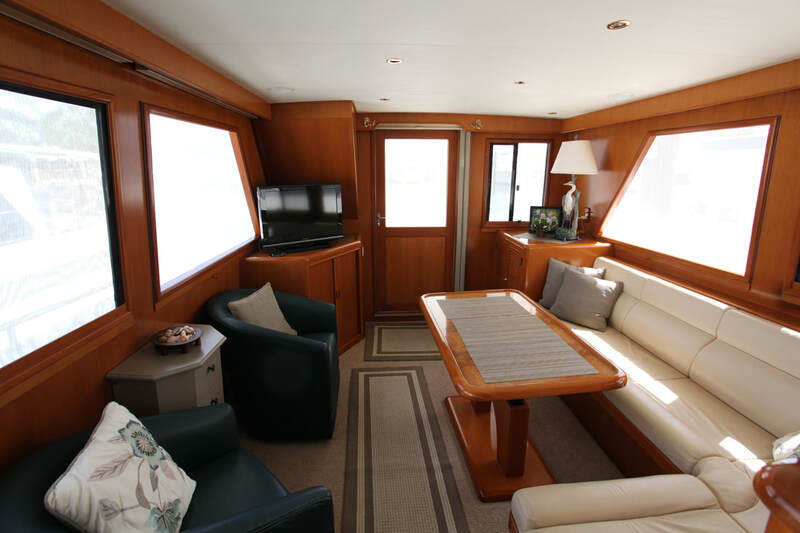 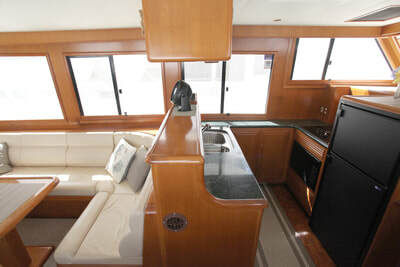 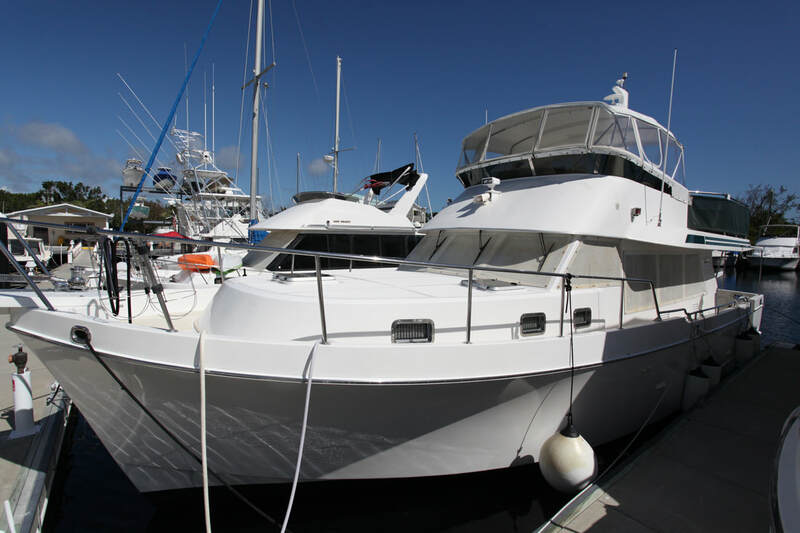 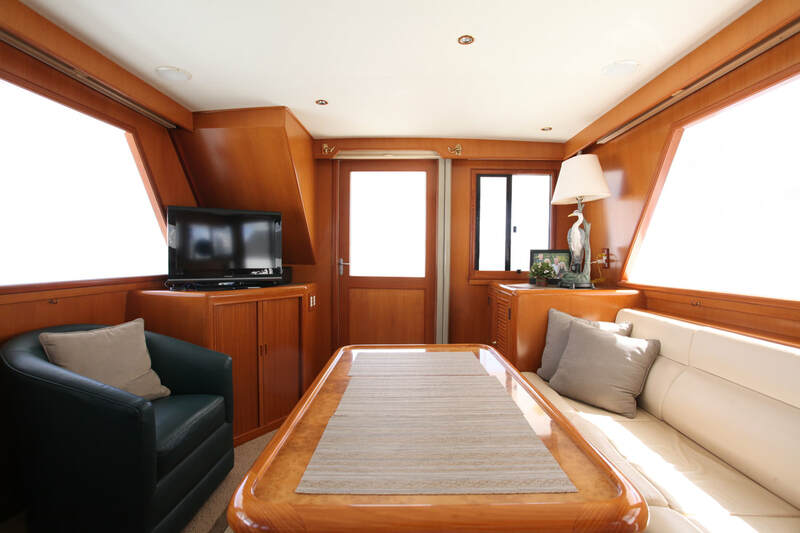 Entering the salon from the covered aftdeck, you will find an L-shaped, built-in sofa and hi/lo teak table to port, entertainment cabinet starboard aft and lounge chairs to starboard. 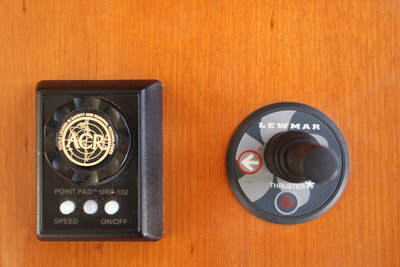 The lower helm is starboard forward and the galley is port forward. 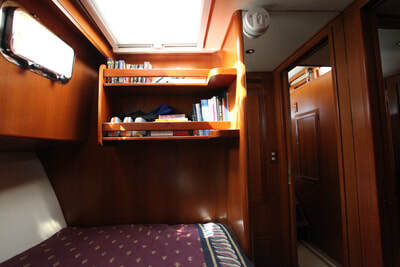 Step down into the guest foyer and the guest stateroom is to port and the master stateroom is forward. 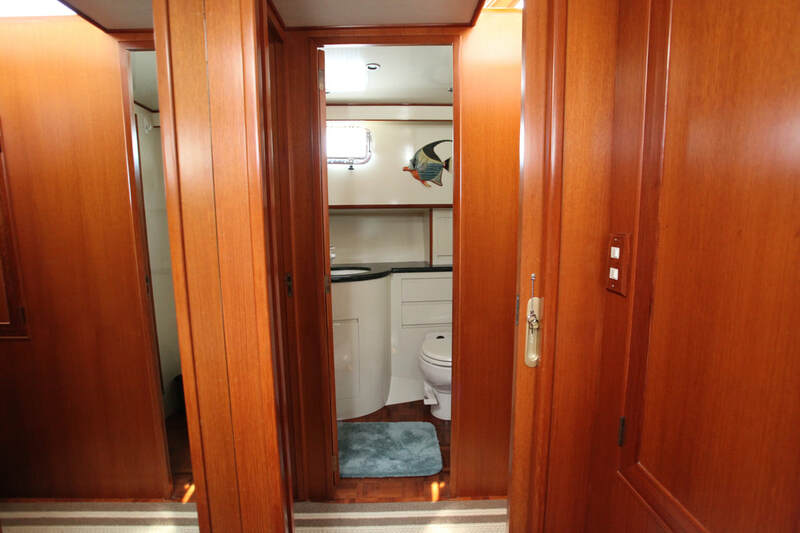 The head and shower are to starboard. 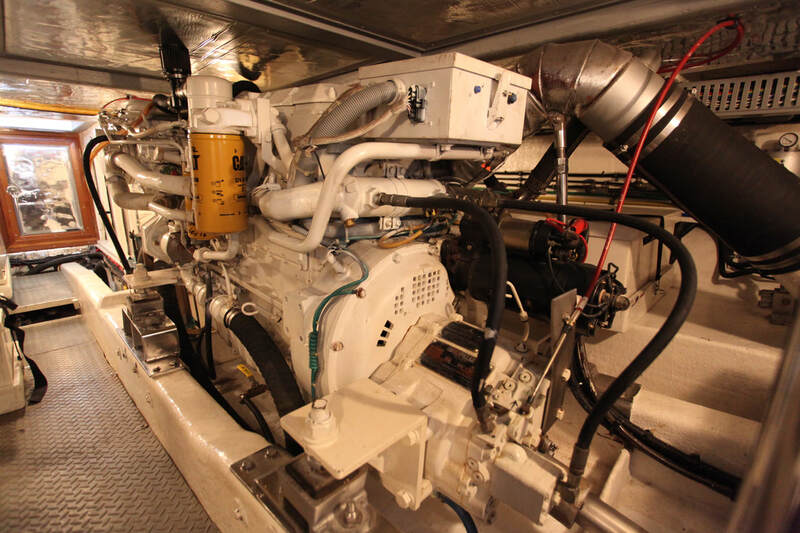 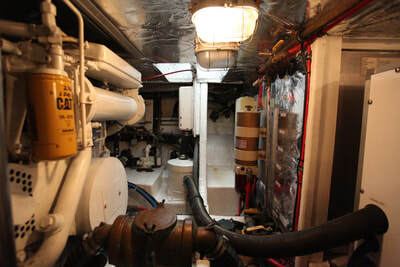 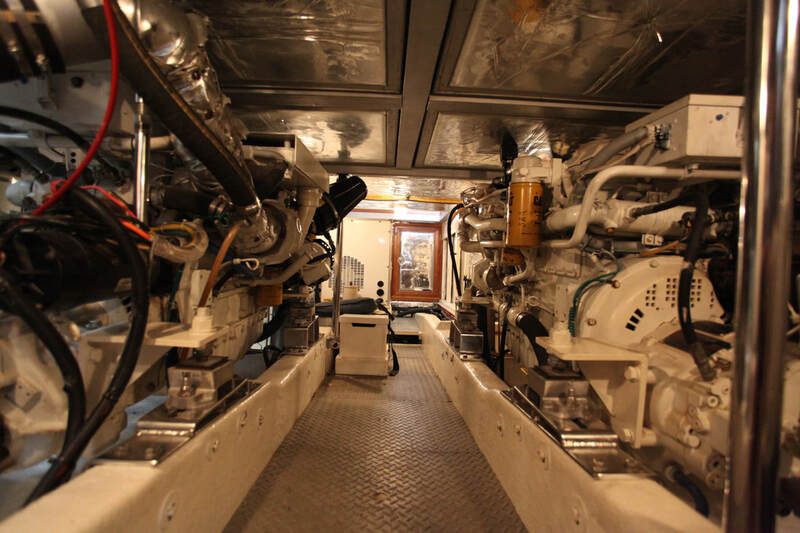 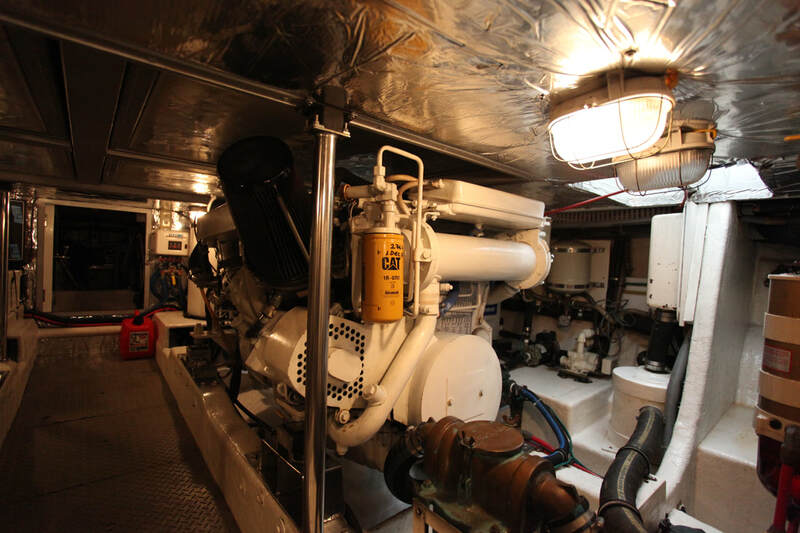 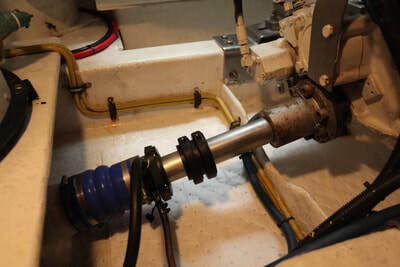 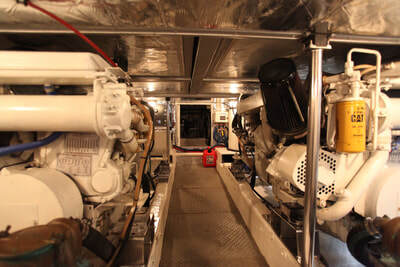 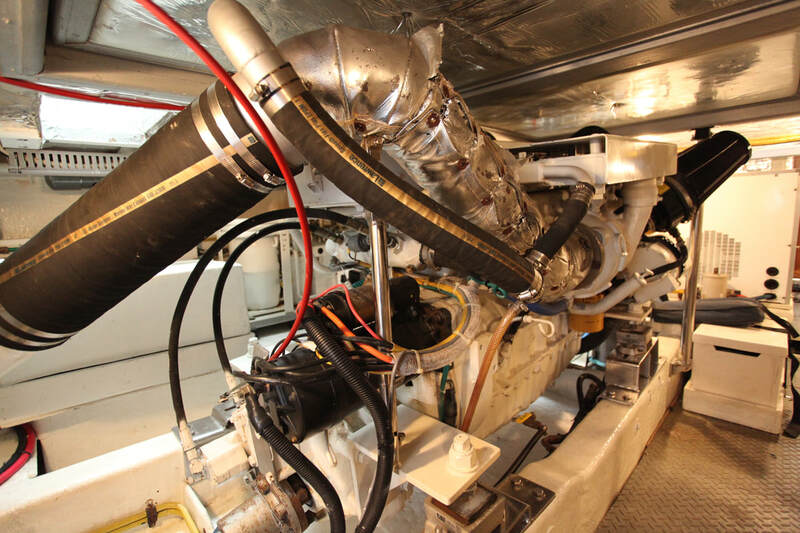 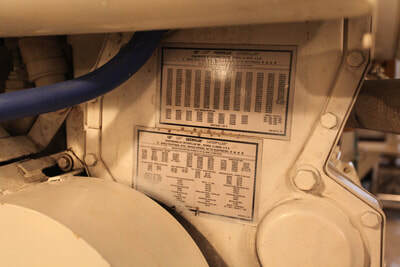 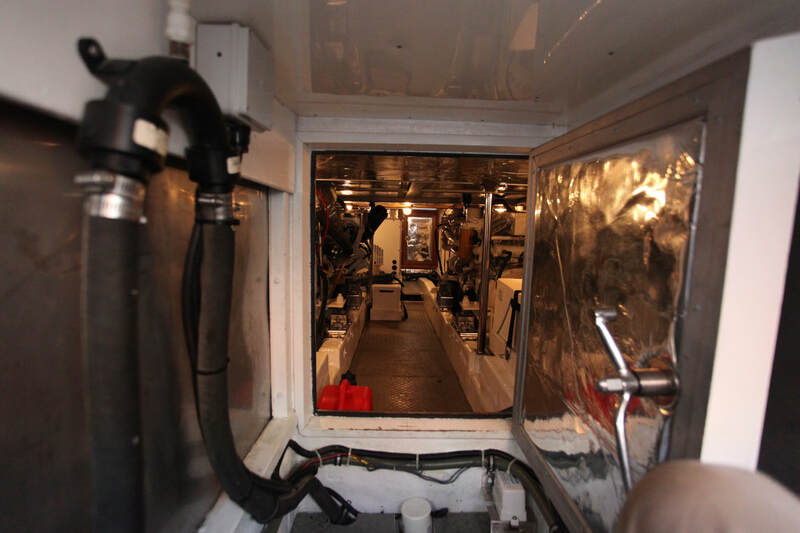 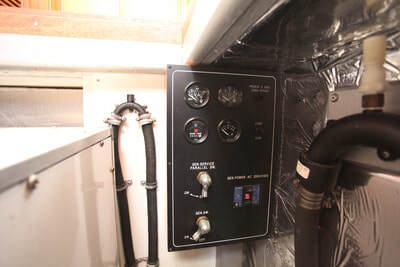 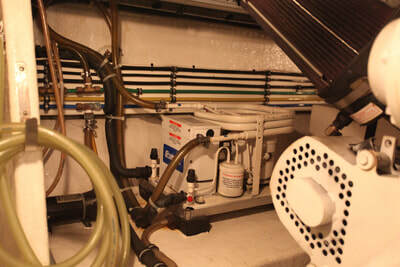 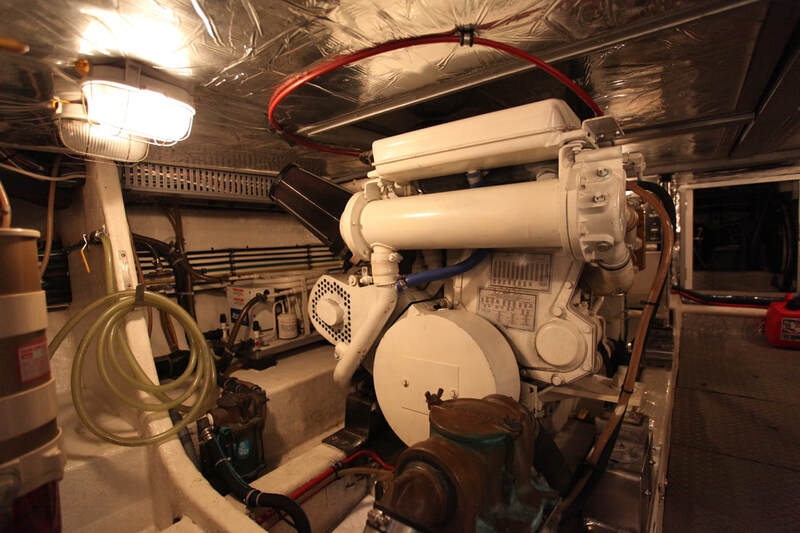 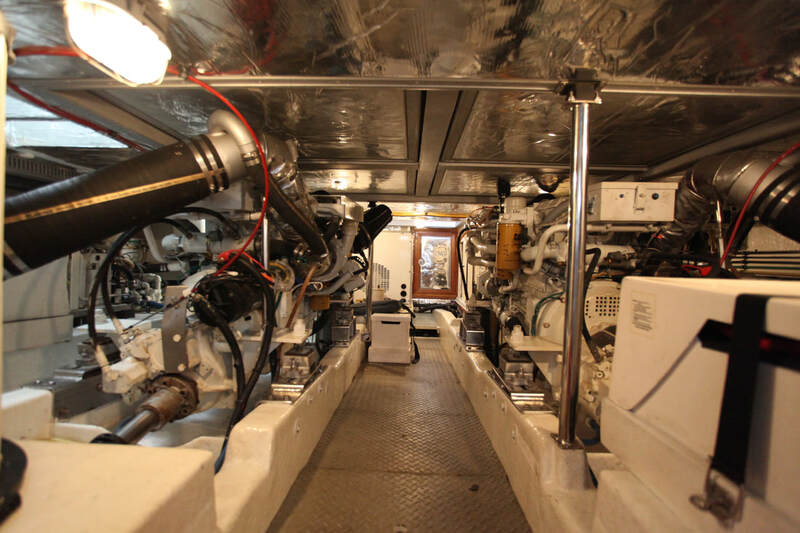 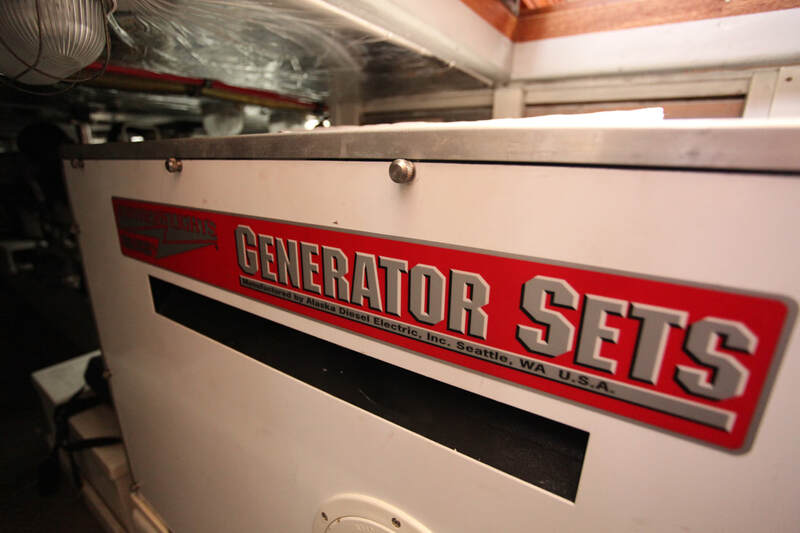 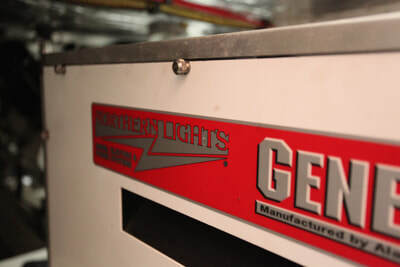 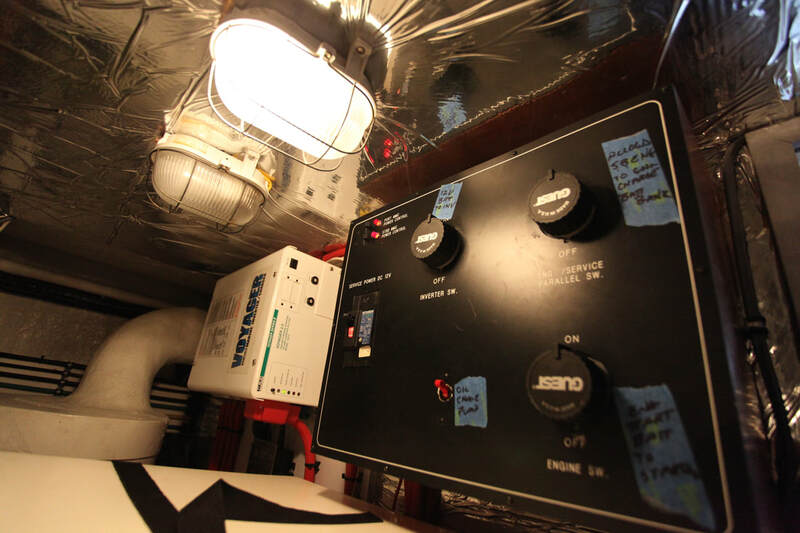 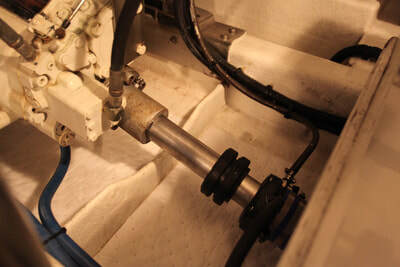 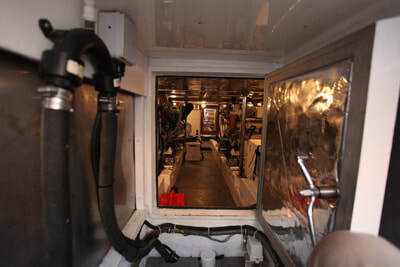 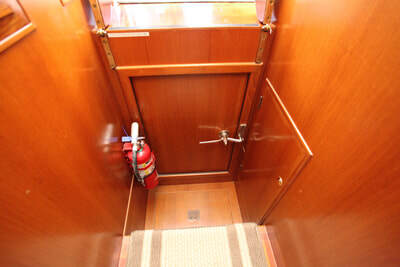 Engine room access is forward or through a sole hatch in the galley or through the lazarette. There are molded-in steps to the flybridge. 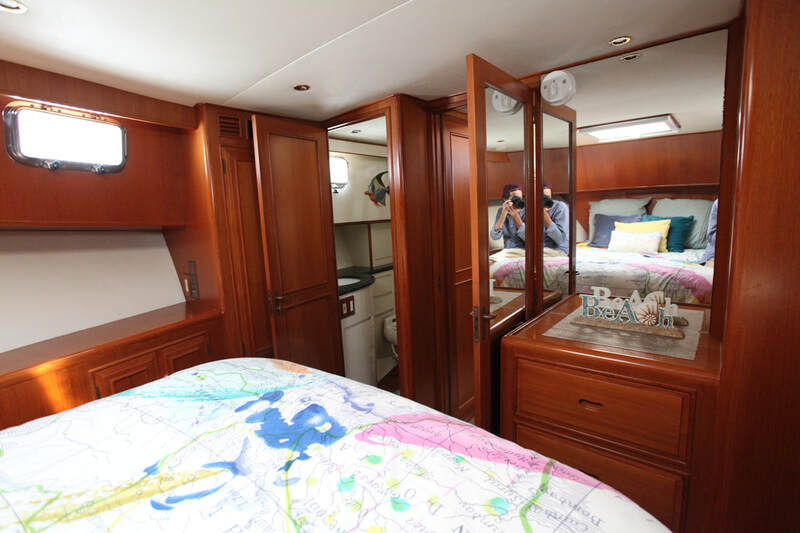 Moonstruck offers a master stateroom forward with a centerline queen size berth and direct access to the head and shower and a guest stateroom to port with a double size berth. 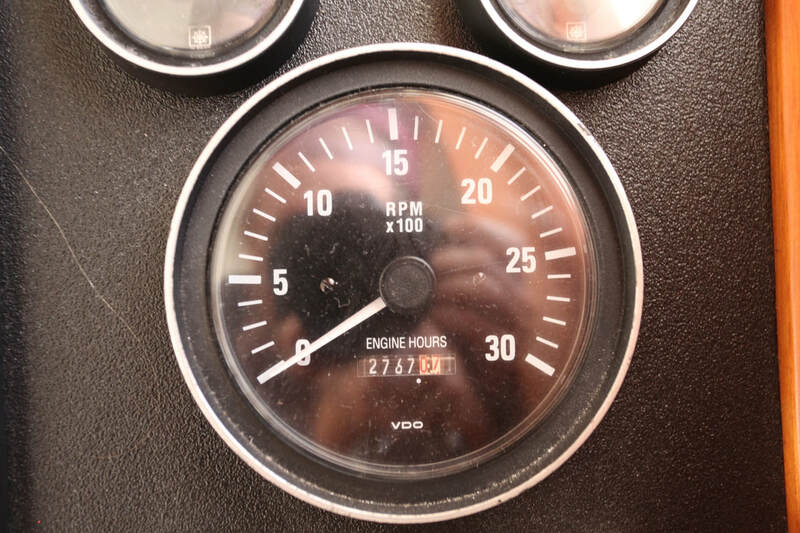 The extremely large head layout and shower are to starboard. The salon offers an entertainment cabinet starboard aft, an L-shaped settee and ho/lo teak table to port and lounge chairs to starboard. 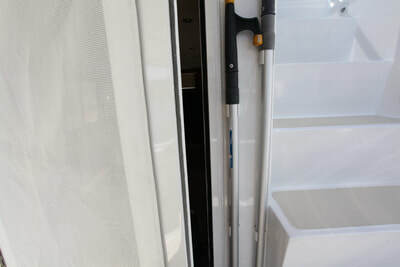 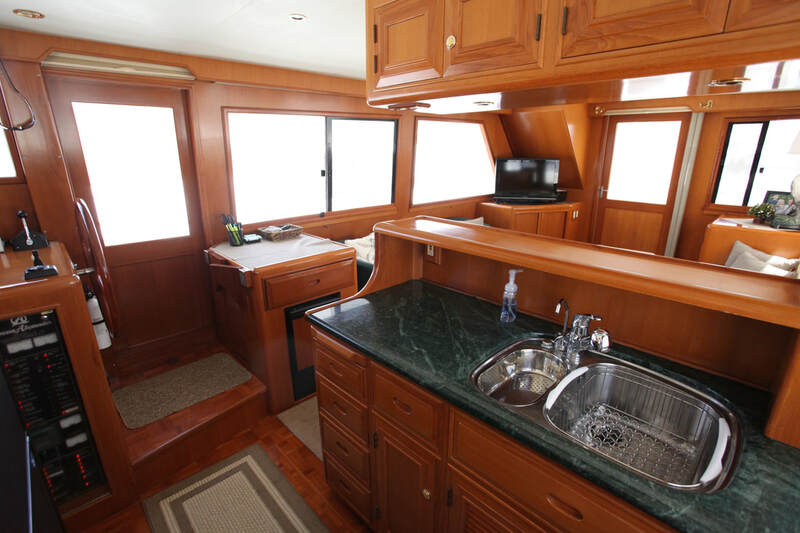 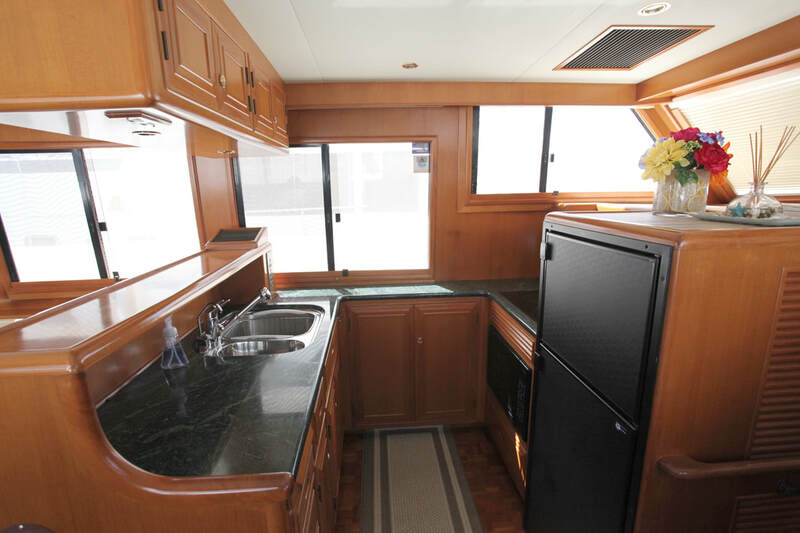 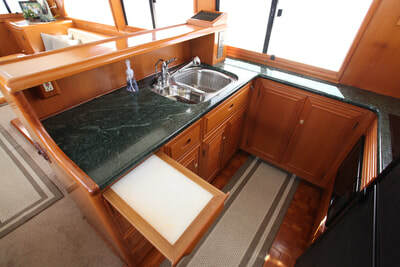 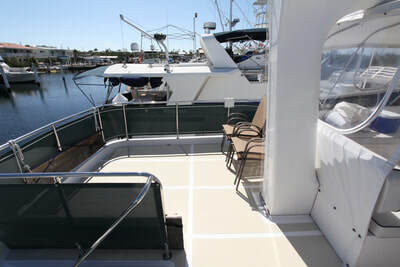 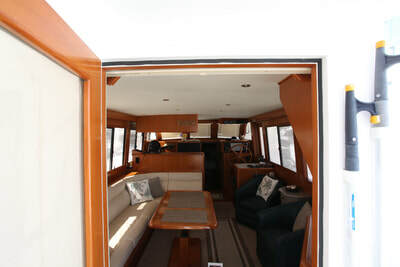 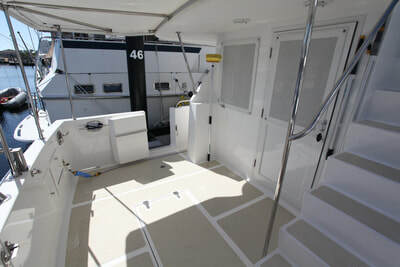 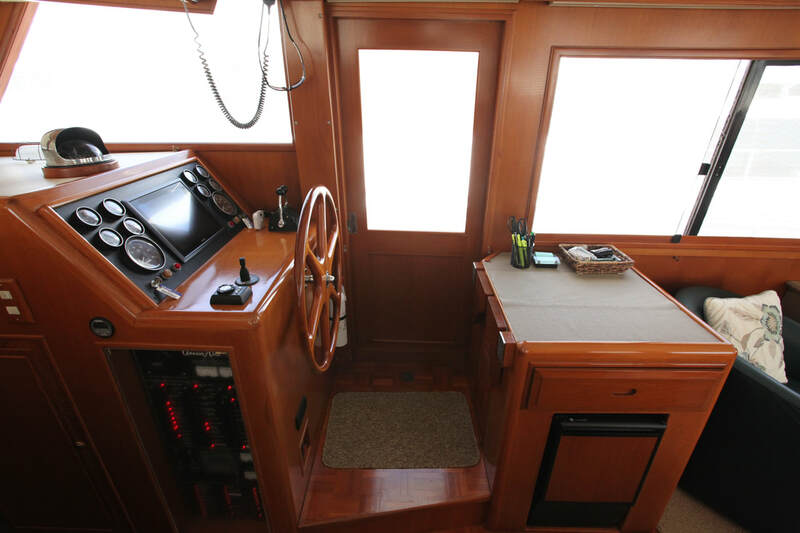 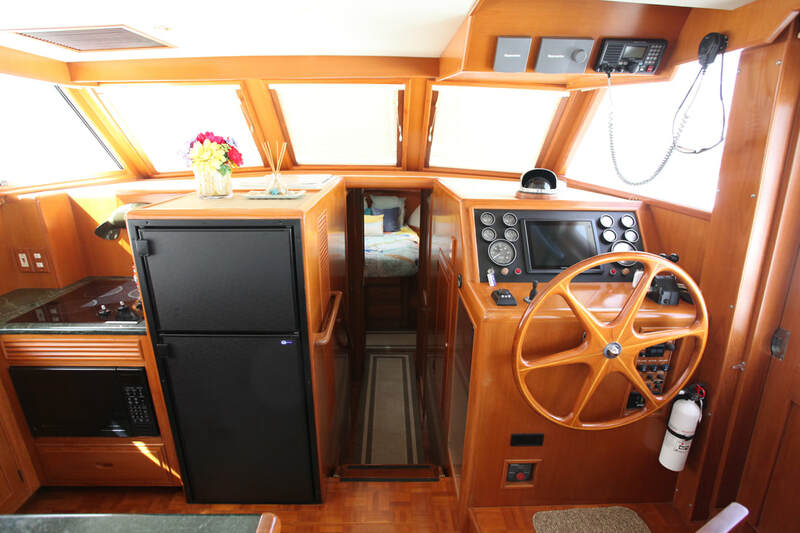 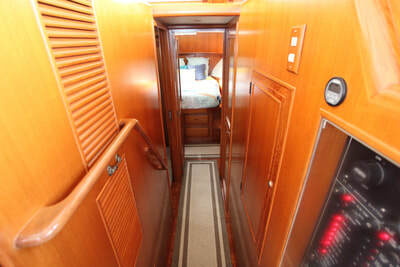 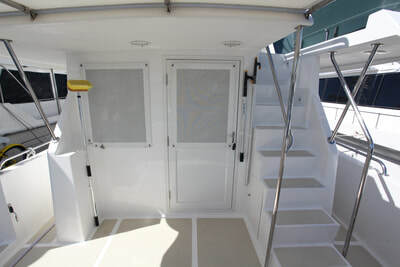 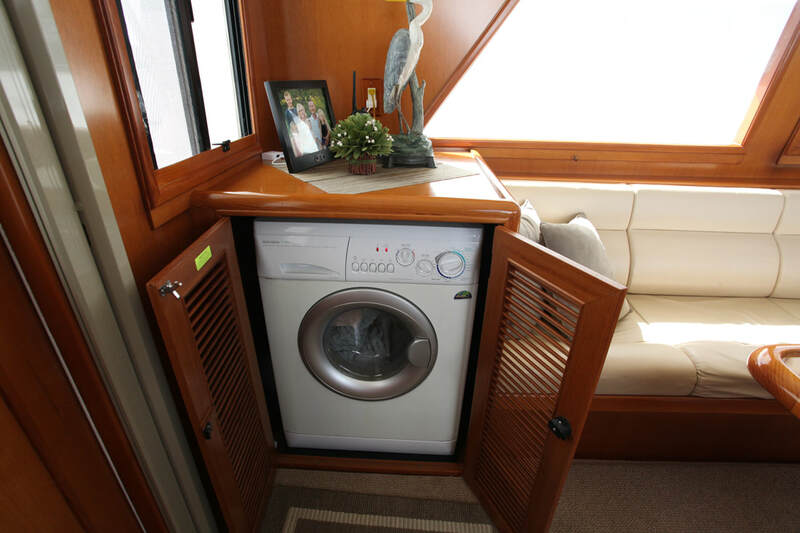 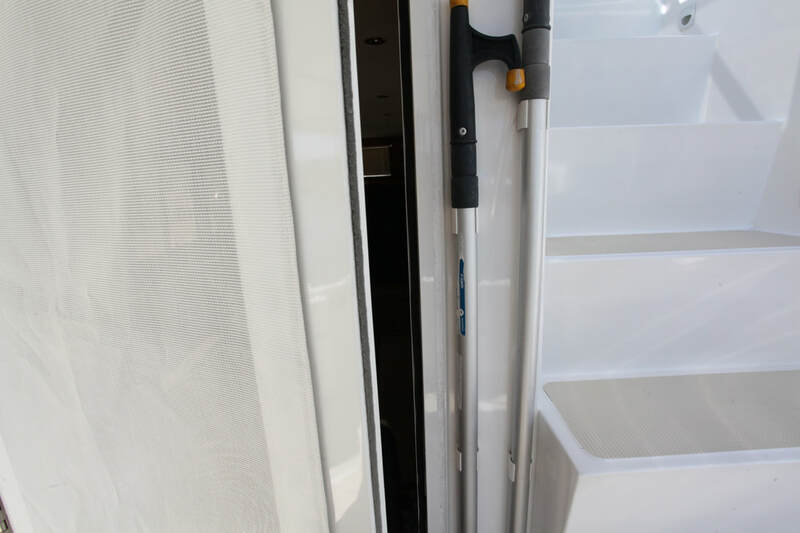 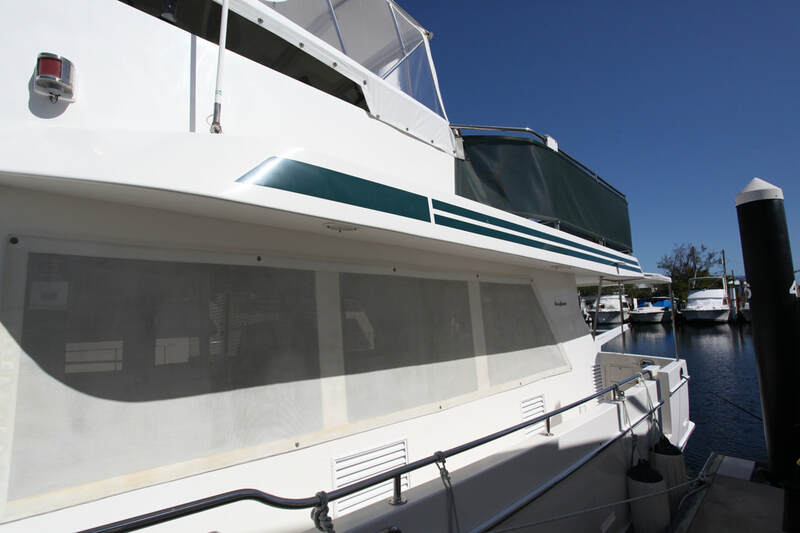 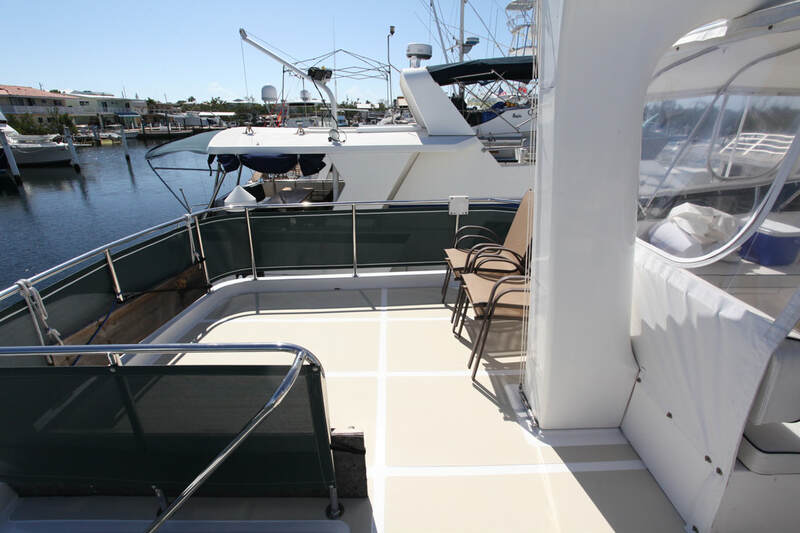 There are opening side windows with screens and Hunter Douglas cordless shades (2013), Phantom roll away screen on the aft door and a teak parquet sole with a area rug. 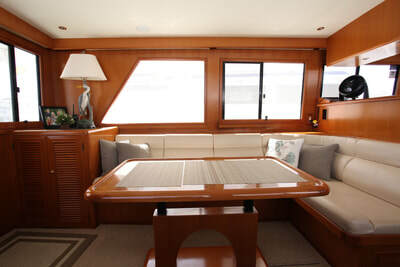 Dining space is available at the salon settee and hi/lo teak table. 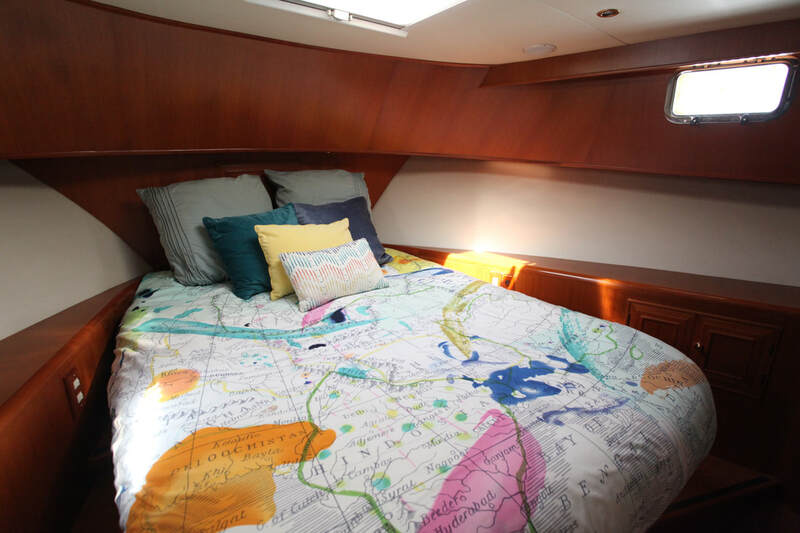 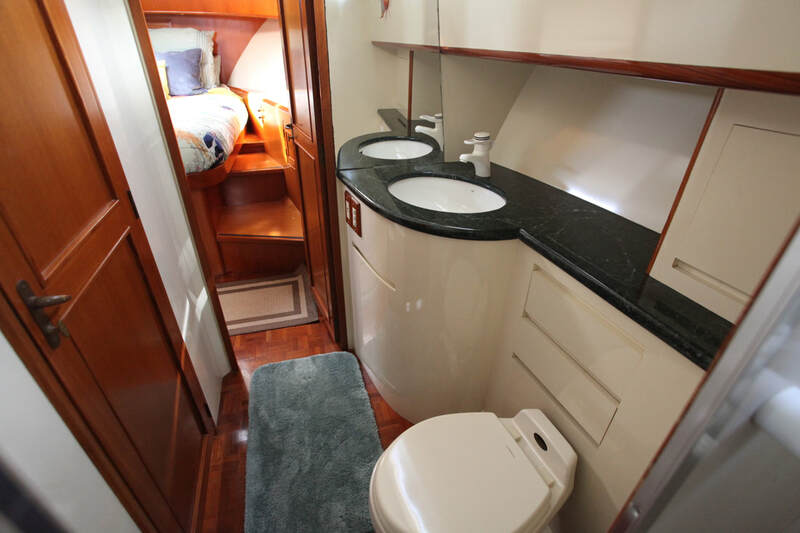 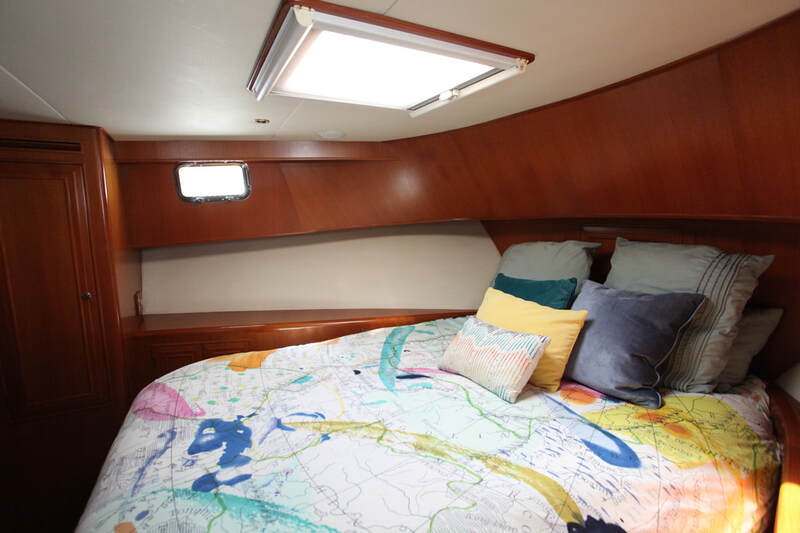 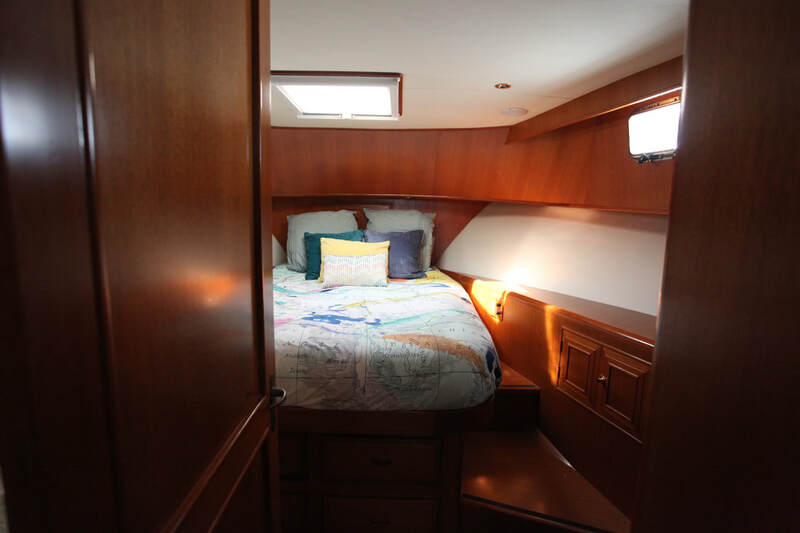 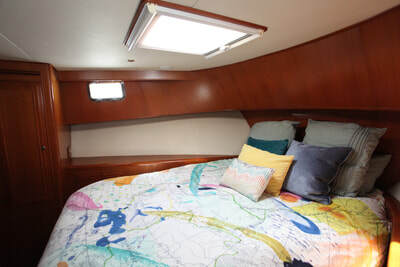 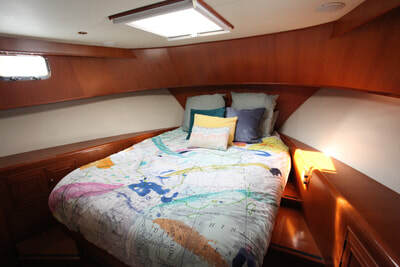 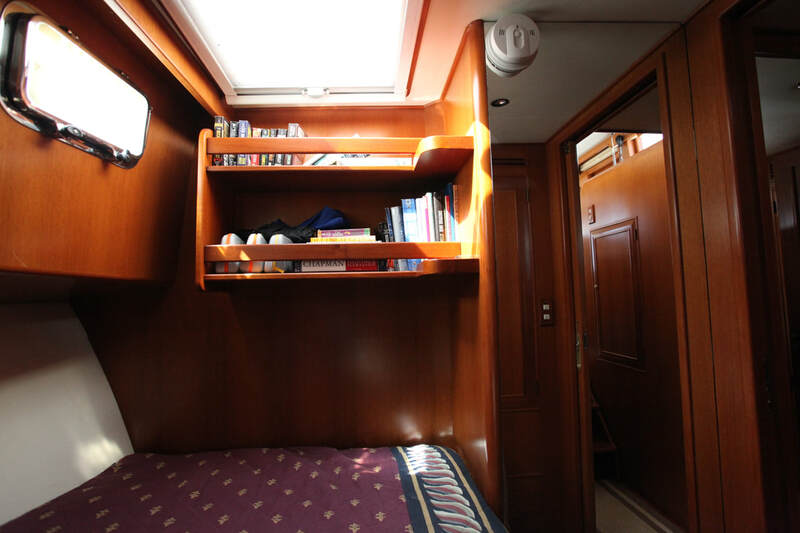 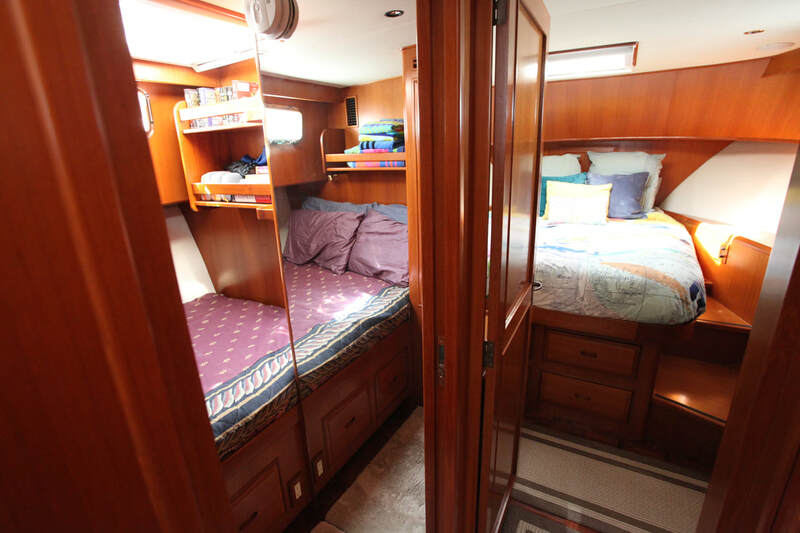 The master stateroom is located forward and offers a centerline queen size berth, hanging lockers, storage drawers and cabinets, overhead hatch with a screen/shade, 2 portlights and a teak parquet sole. Direct access to the head and shower. 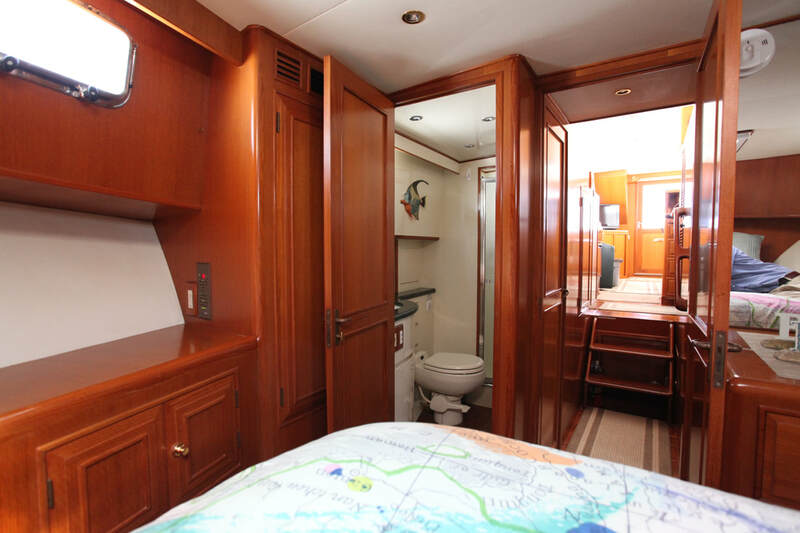 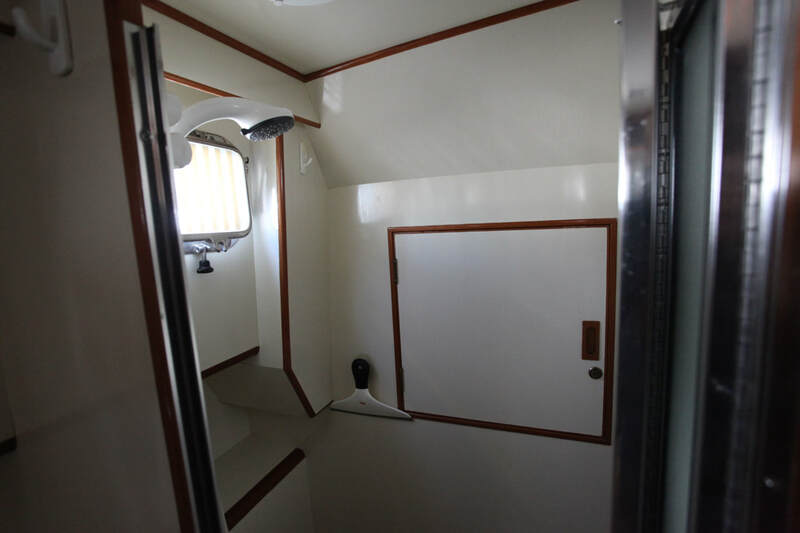 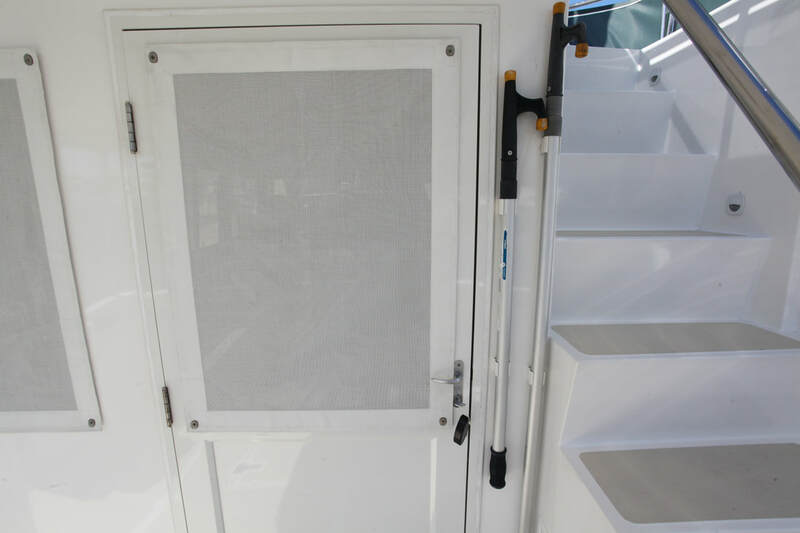 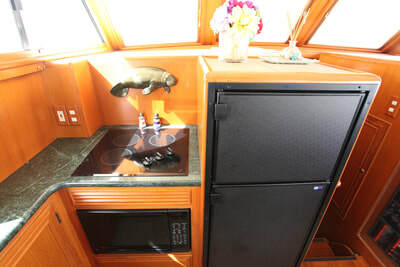 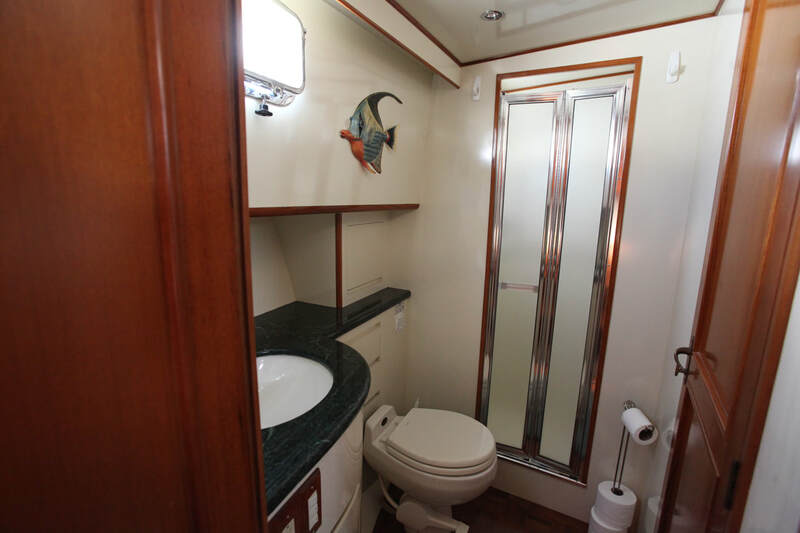 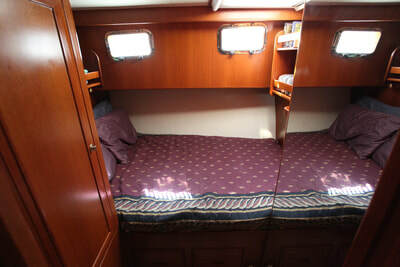 The guest stateroom is located to port and offers a double size berth, hanging locker, storage drawers, shelves, 2 portlights and an overhead hatch with screen/shade and teak parquet sole. 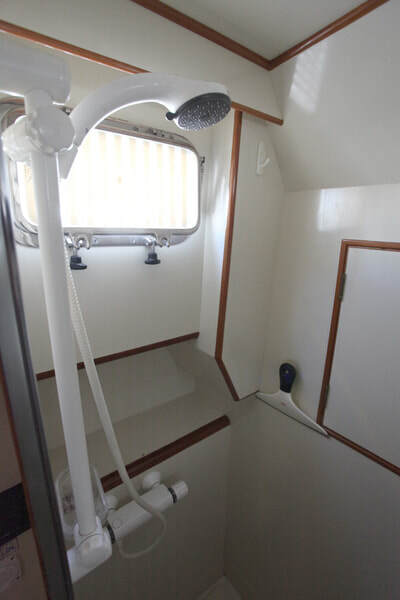 The head and shower are to starboard. 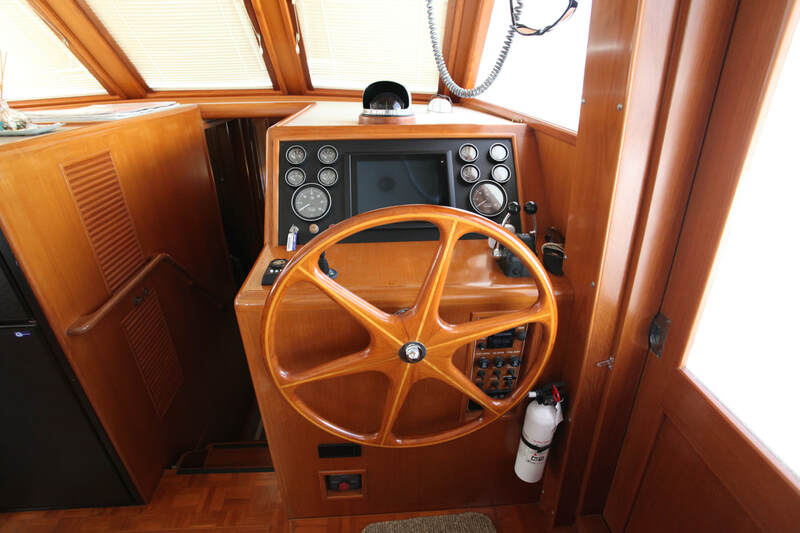 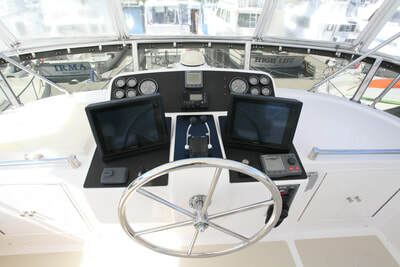 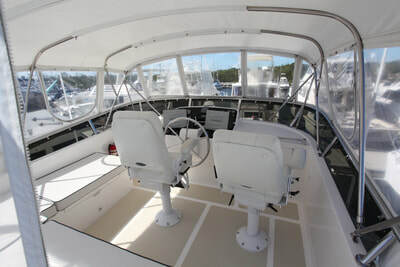 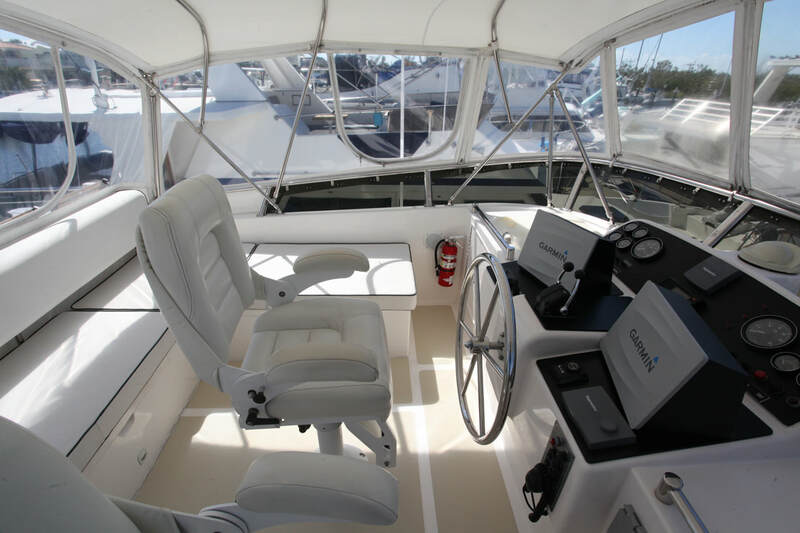 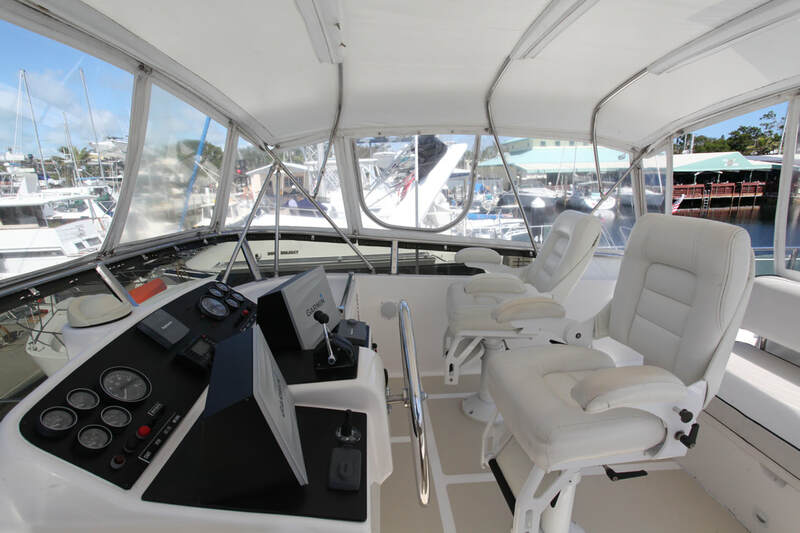 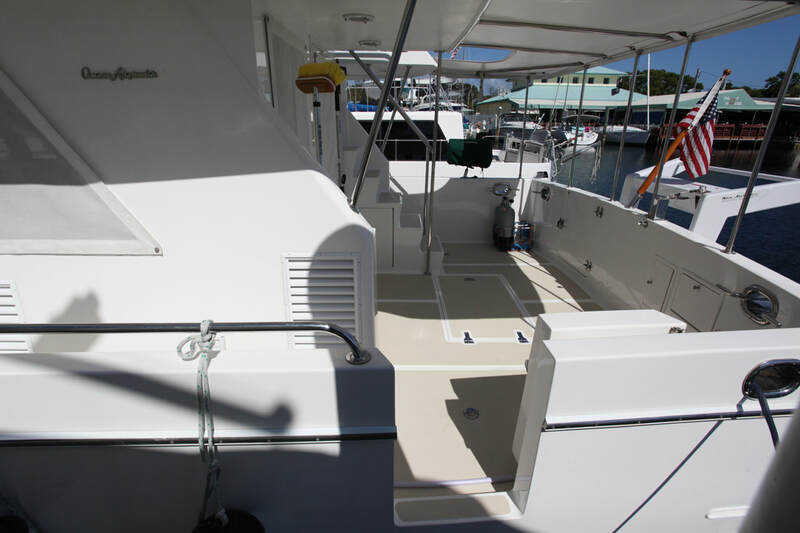 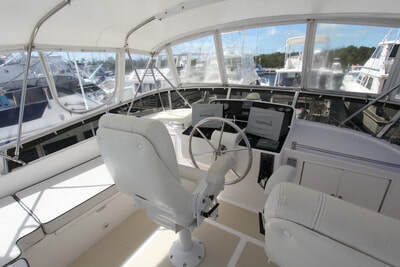 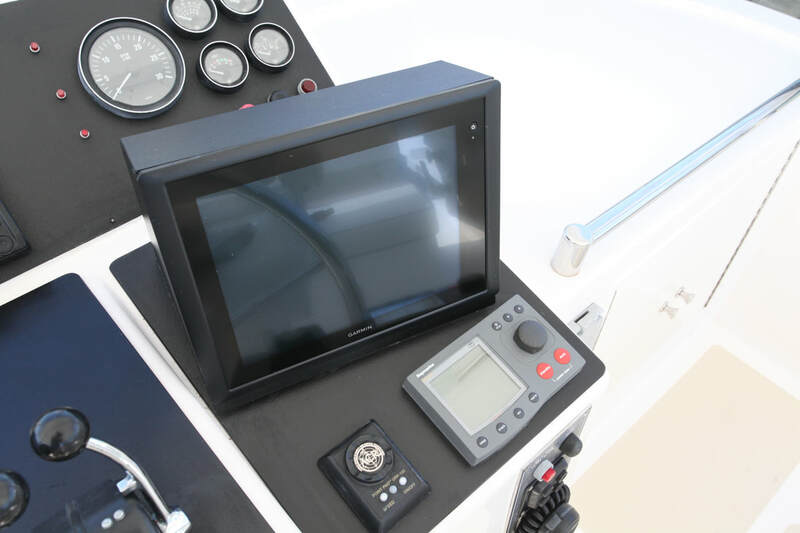 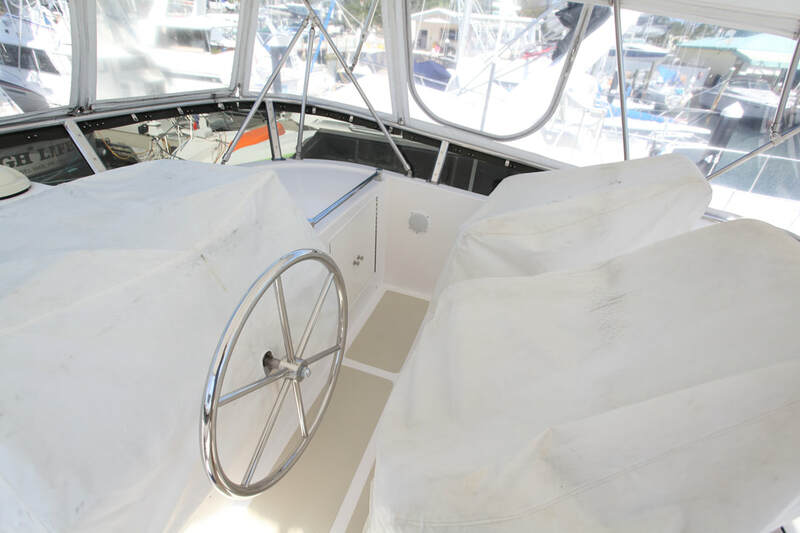 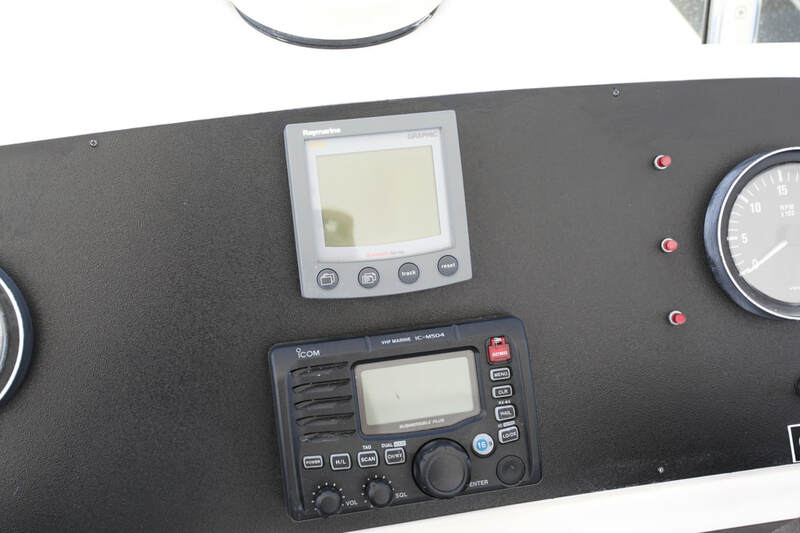 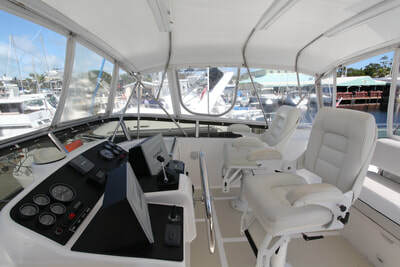 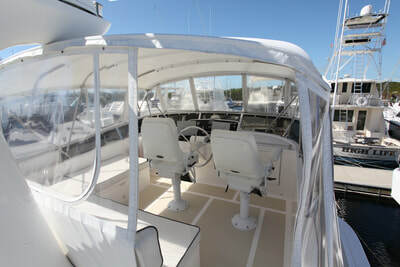 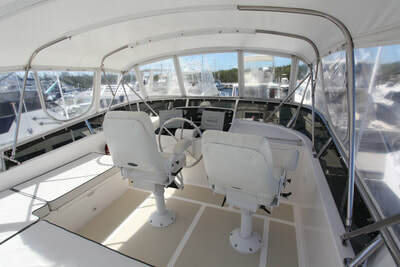 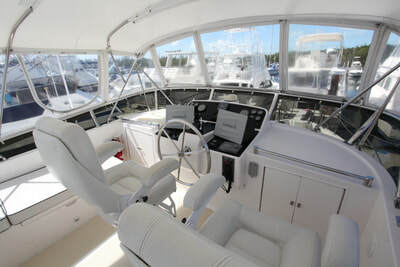 The lower helm is located starboard forward in the salon and offers a full helm and side deck access door. 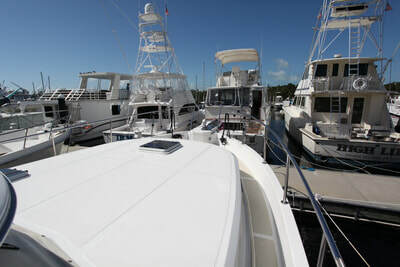 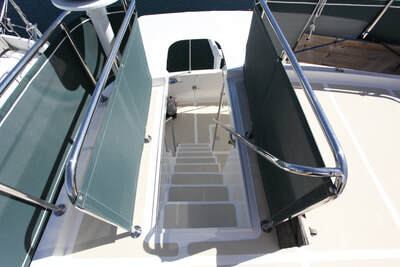 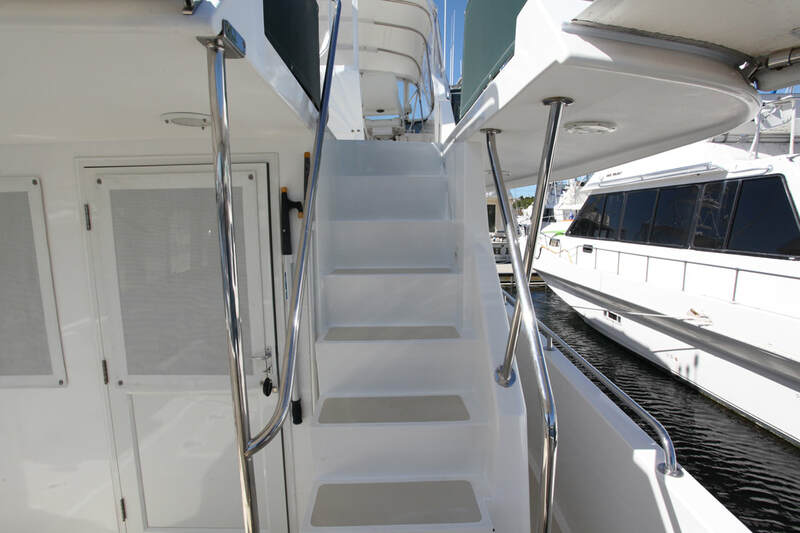 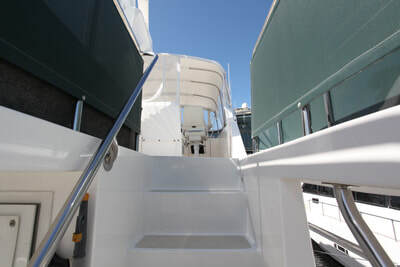 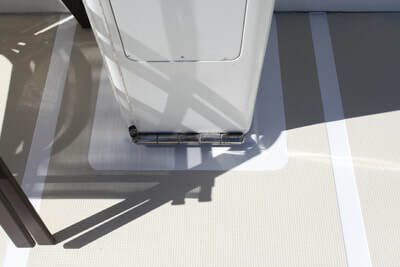 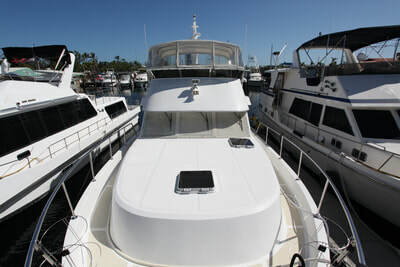 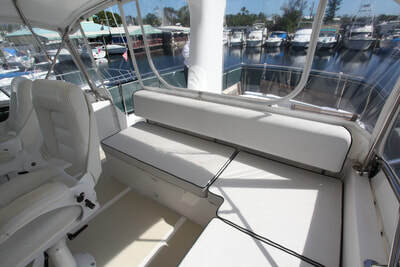 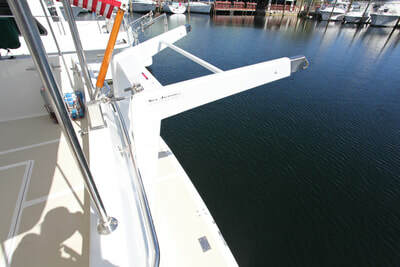 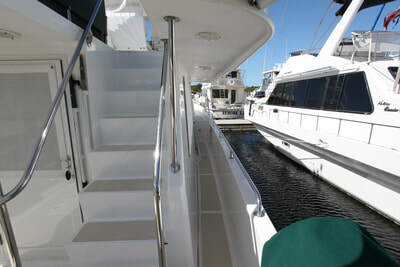 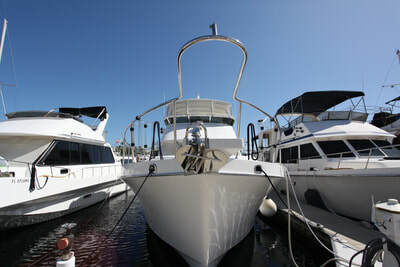 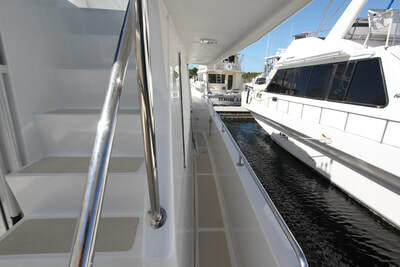 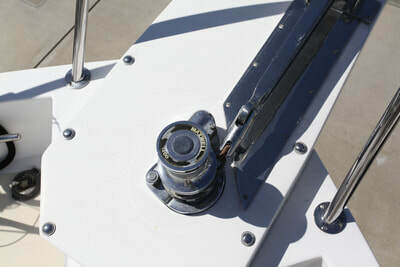 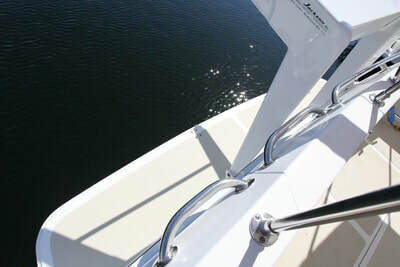 The molded-in steps accesses from covered aftdeck to the flybridge. 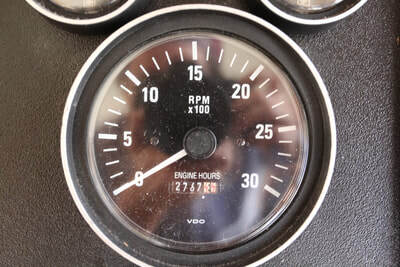 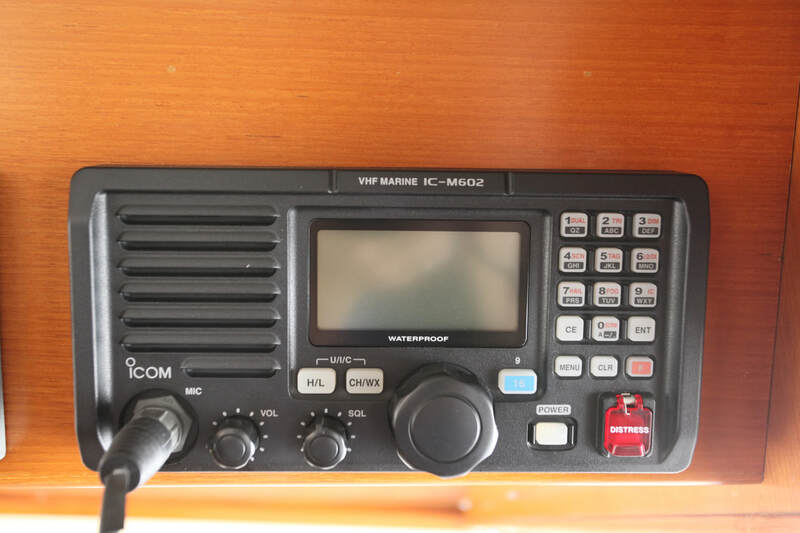 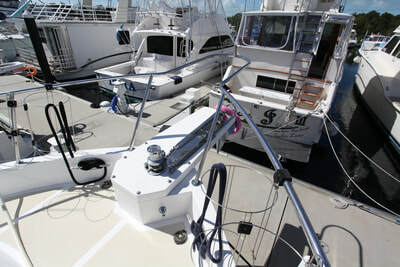 The hinged mast allows the Great Loop journey. 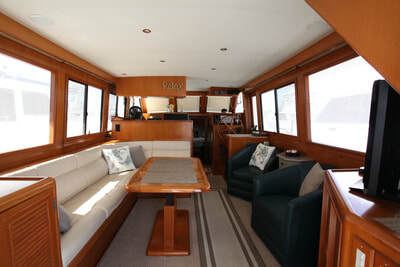 Large open lounge area aft. 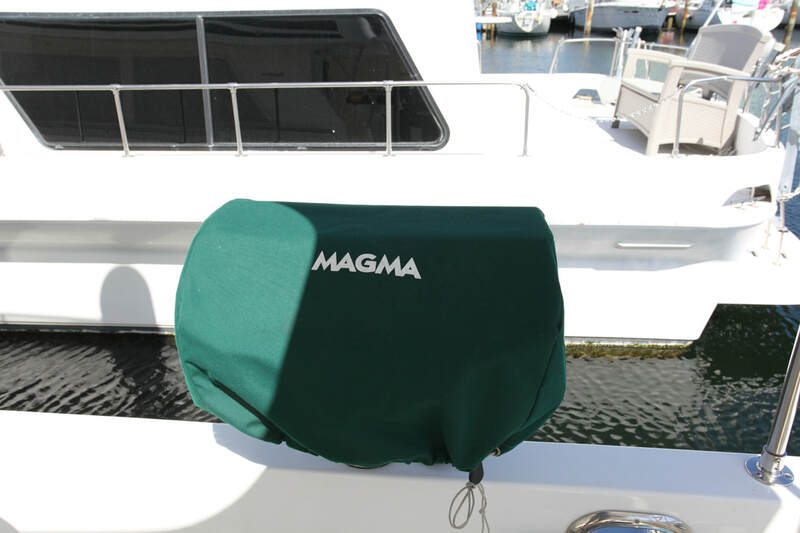 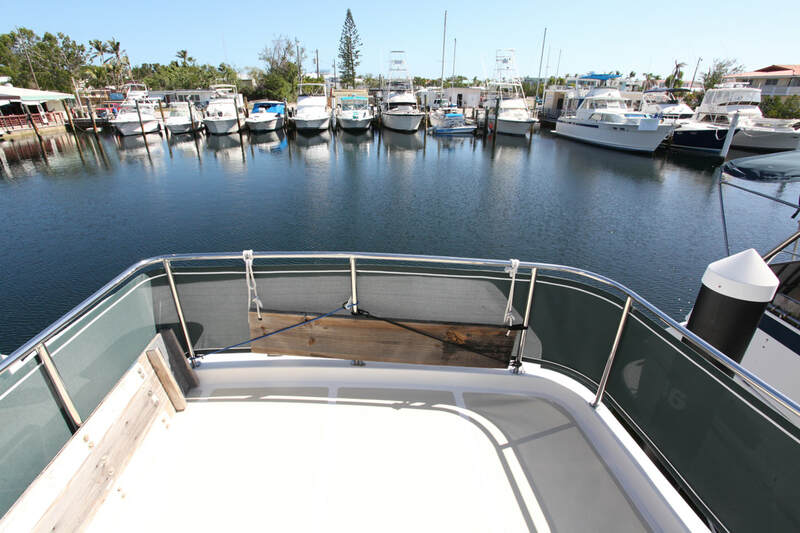 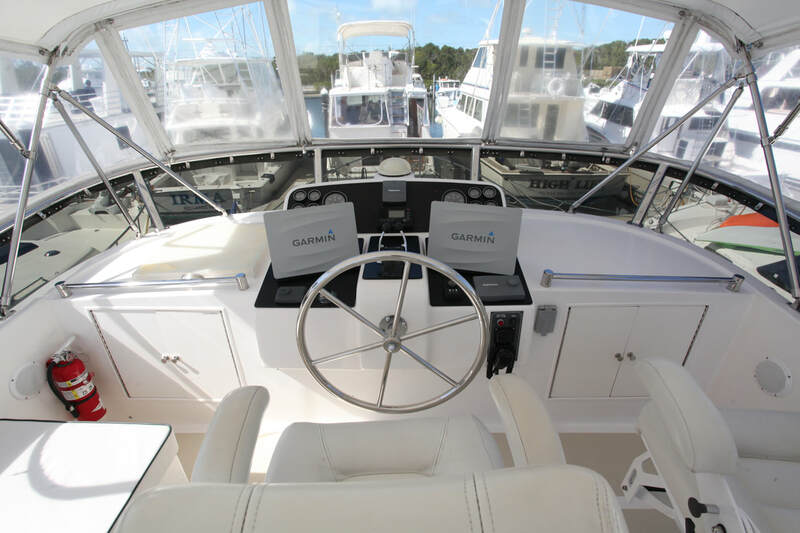 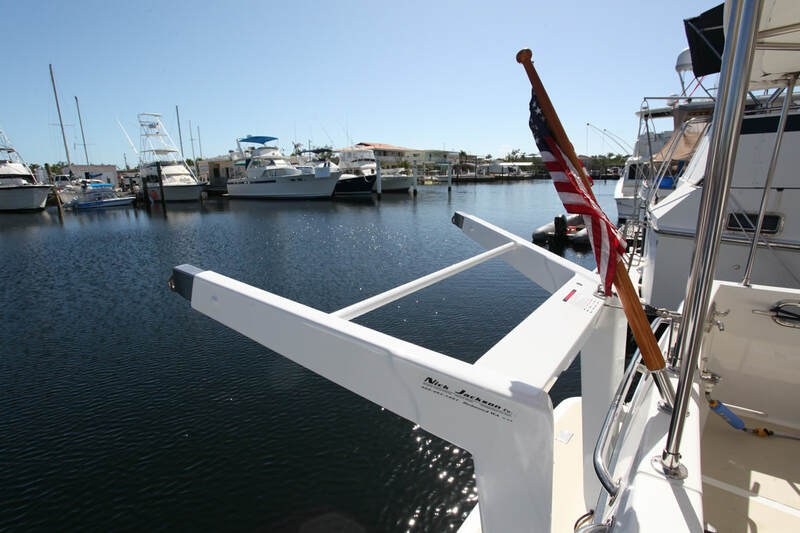 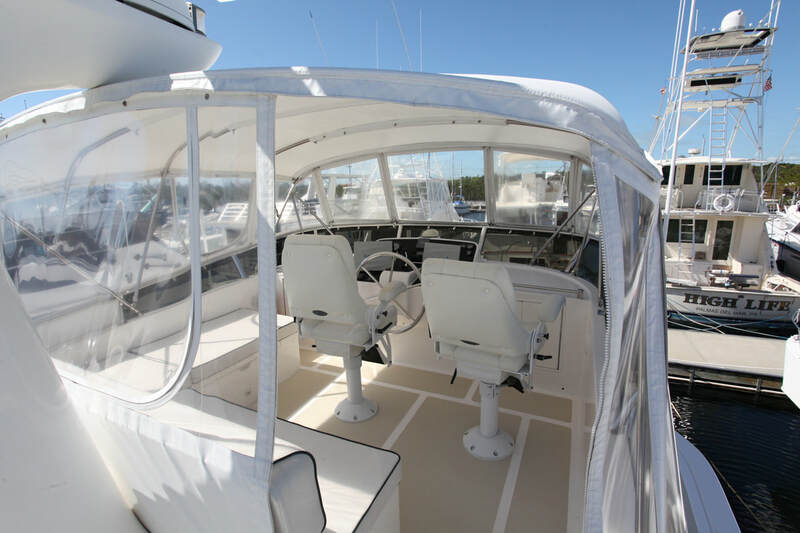 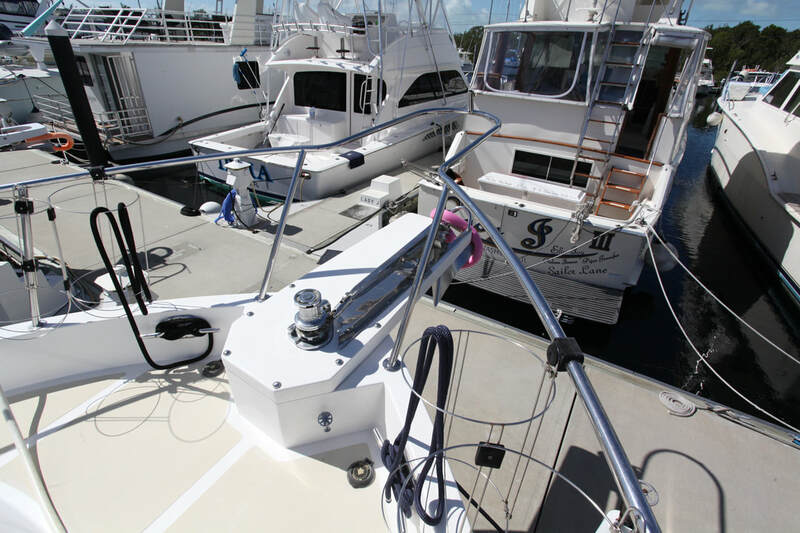 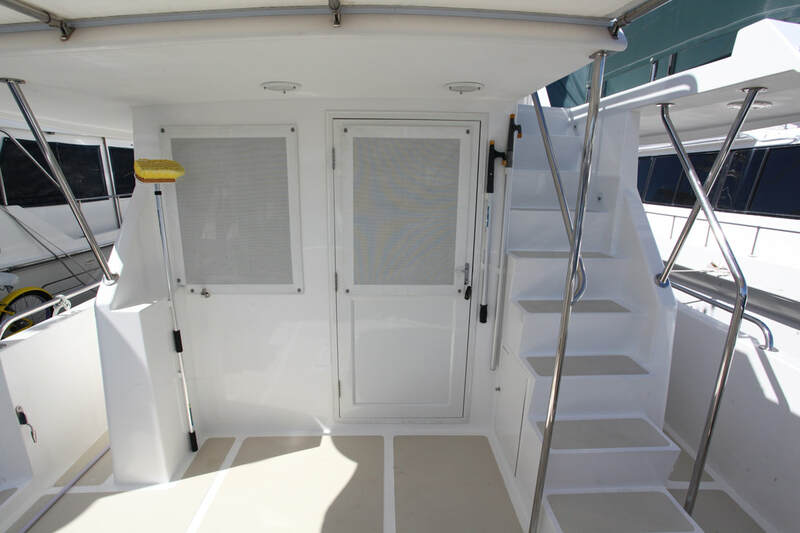 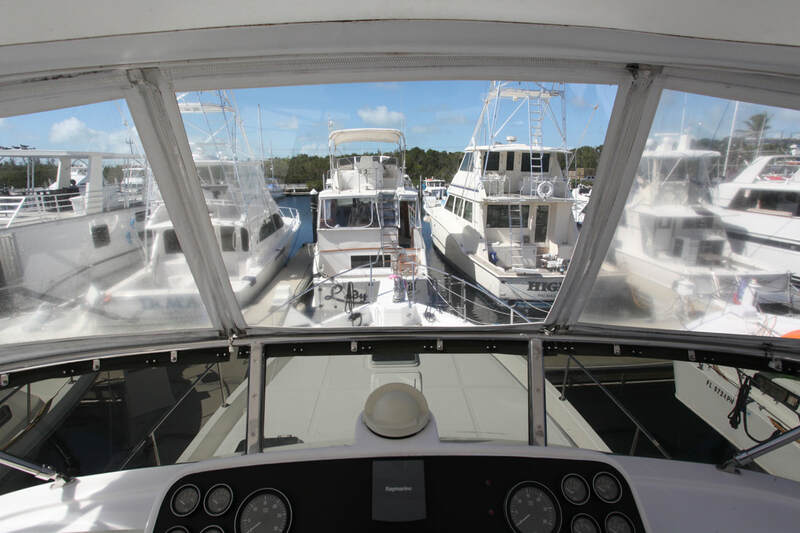 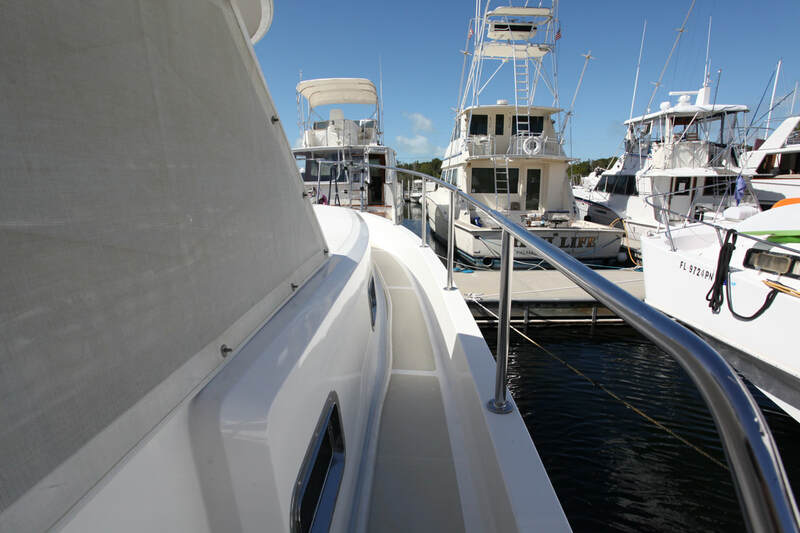 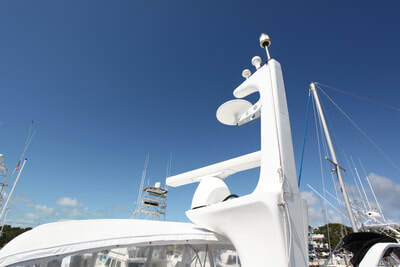 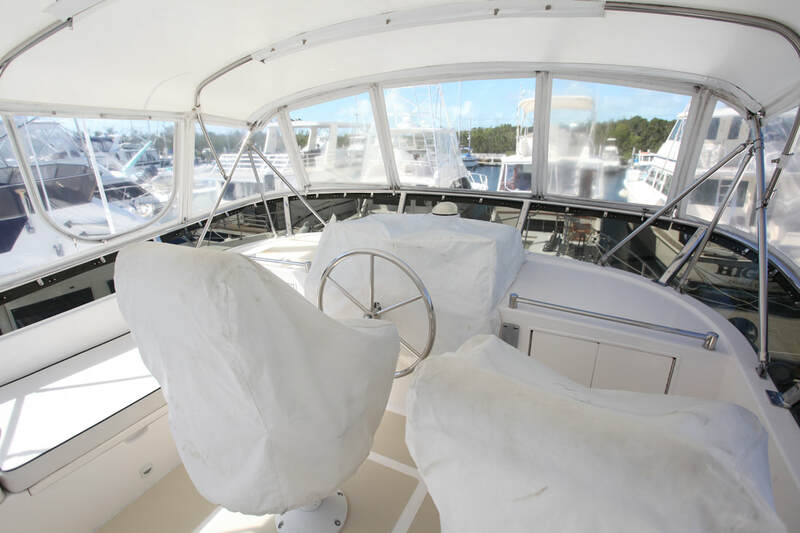 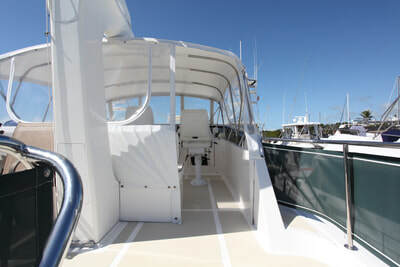 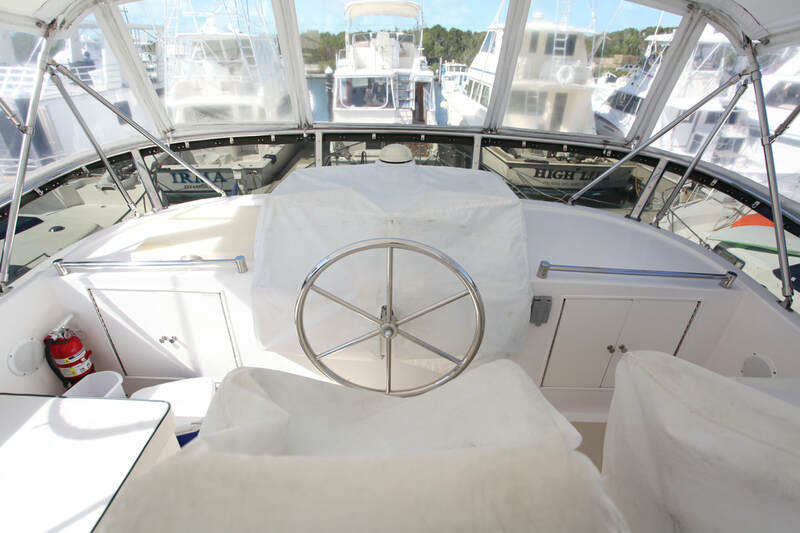 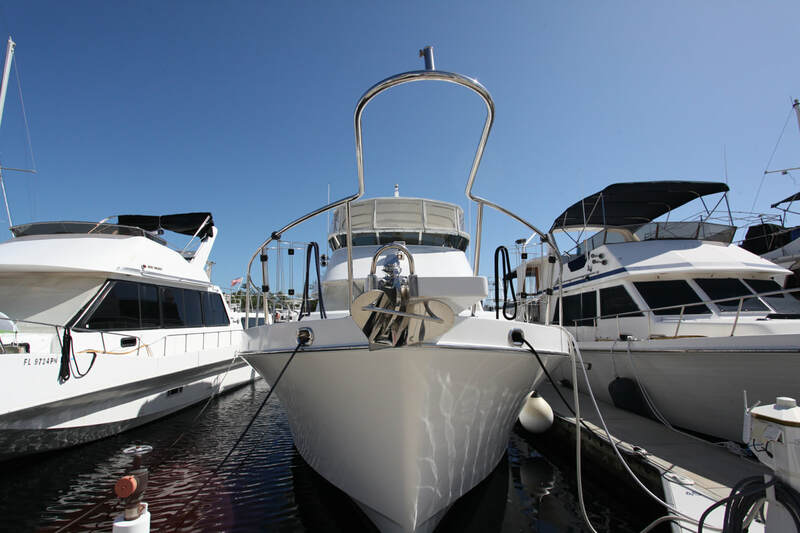 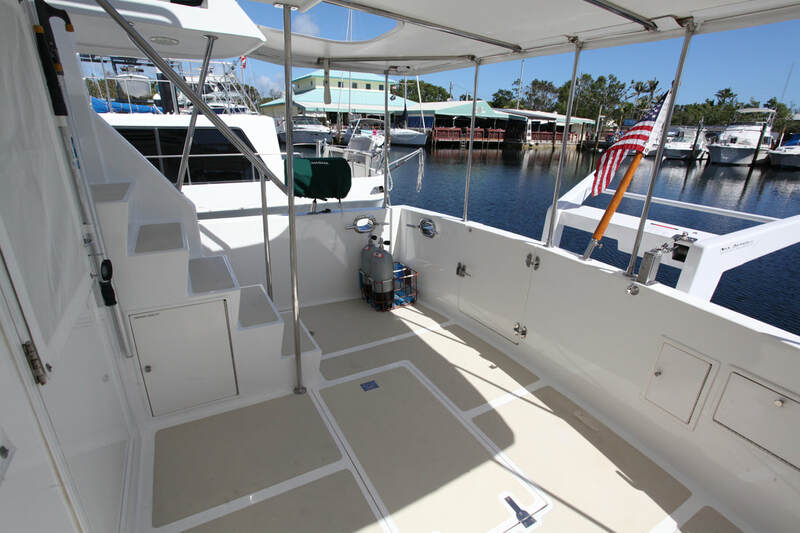 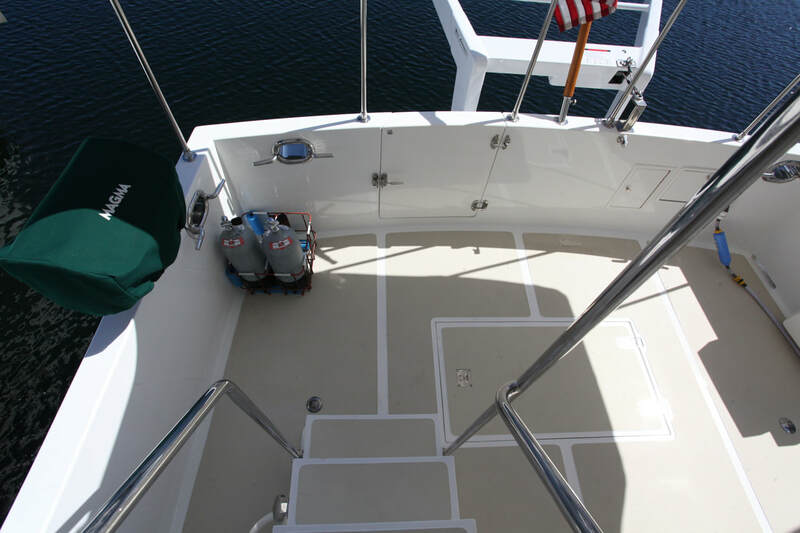 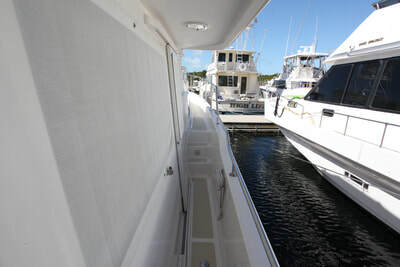 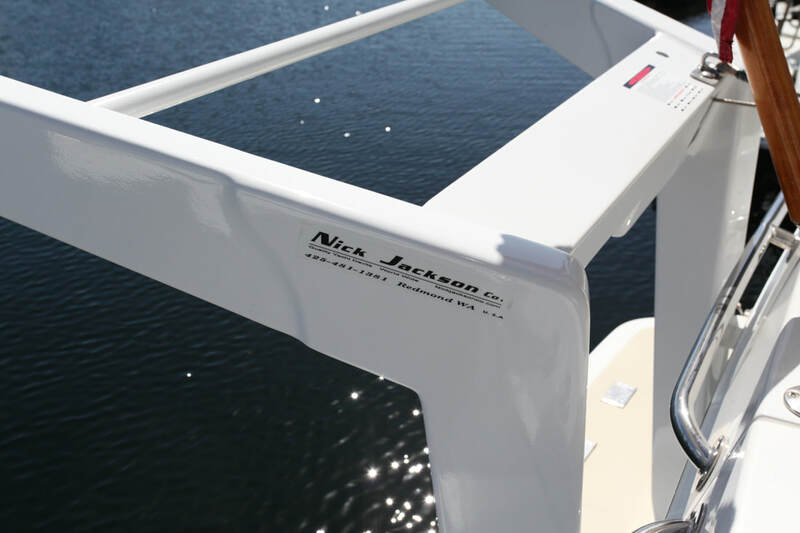 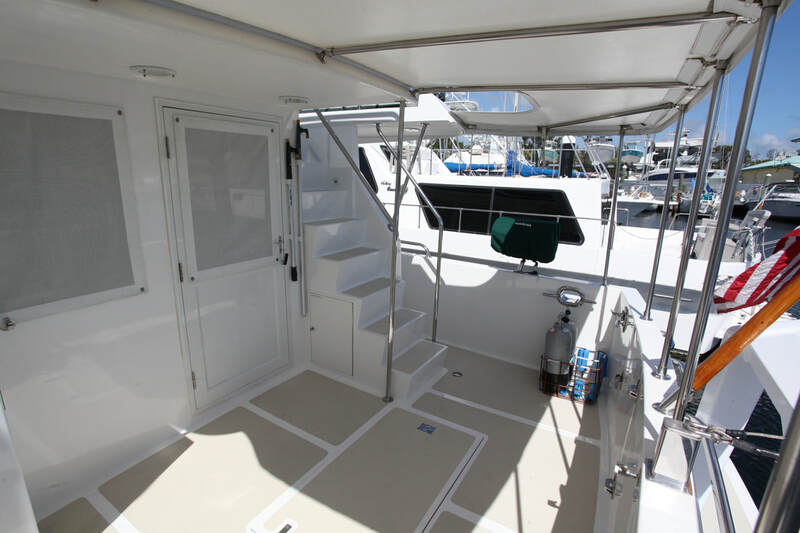 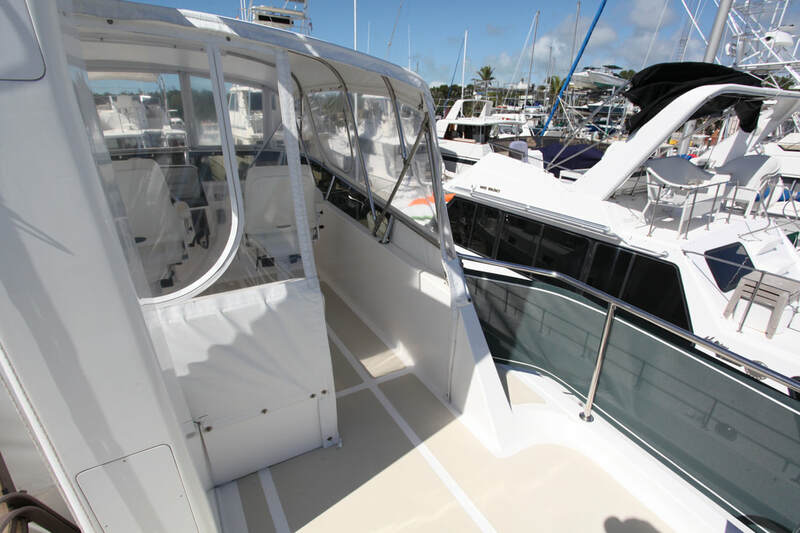 The aftdeck is covered by a Stamoid top over a stainless steel frame and offers same level access to each side deck, including molded-in steps to the flybridge. 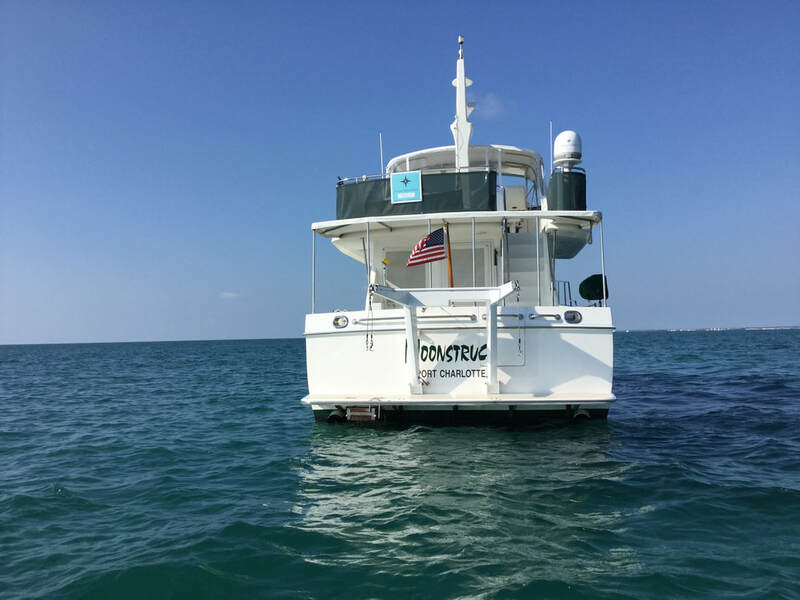 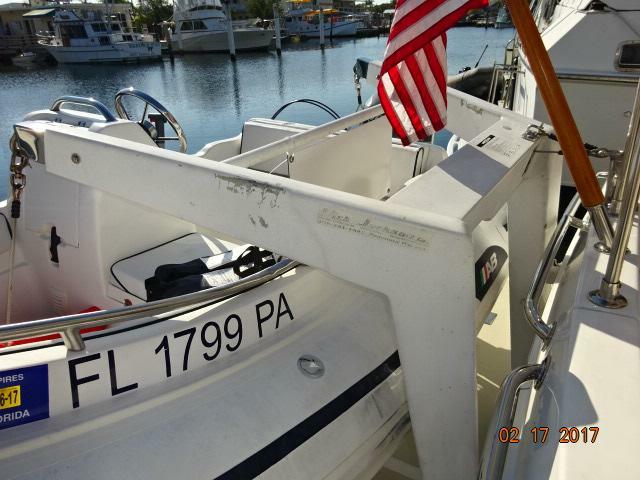 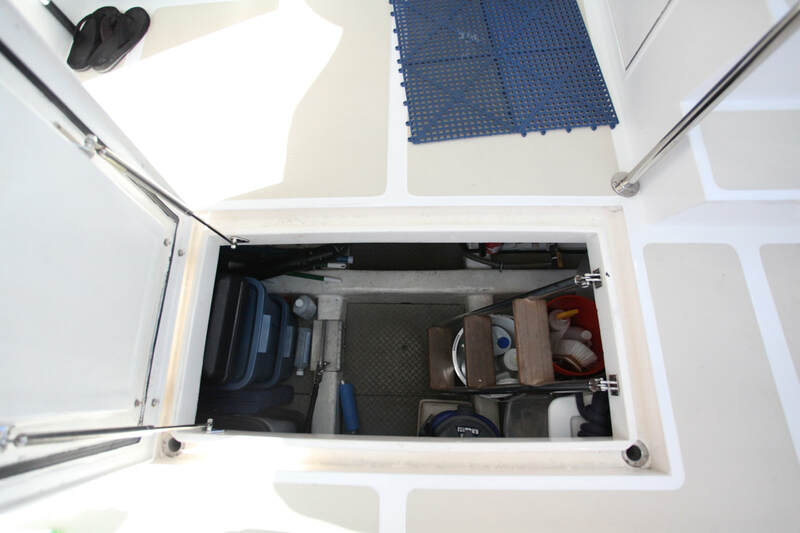 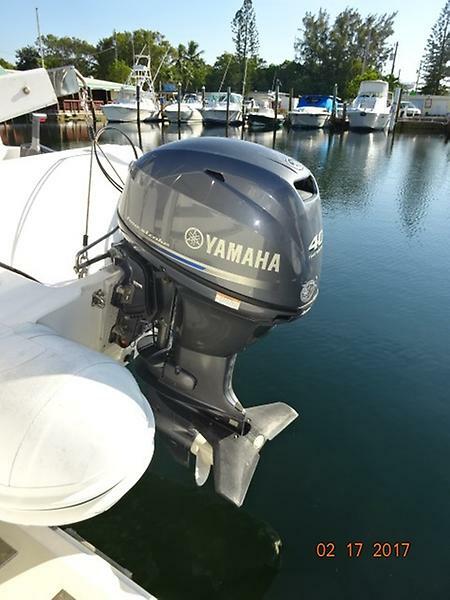 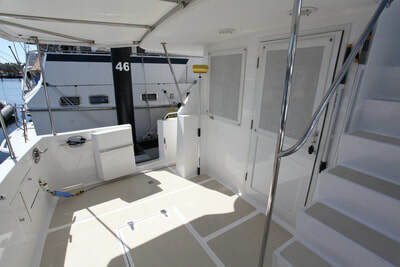 Access to the vessel is starboard forward, transom door to the swim platform, port side bulwark door. Water is supplied by fresh water shower, raw water washdown and a dock water connection.